Several exciting tidbits were talked about during the Q&A portions of the convention. 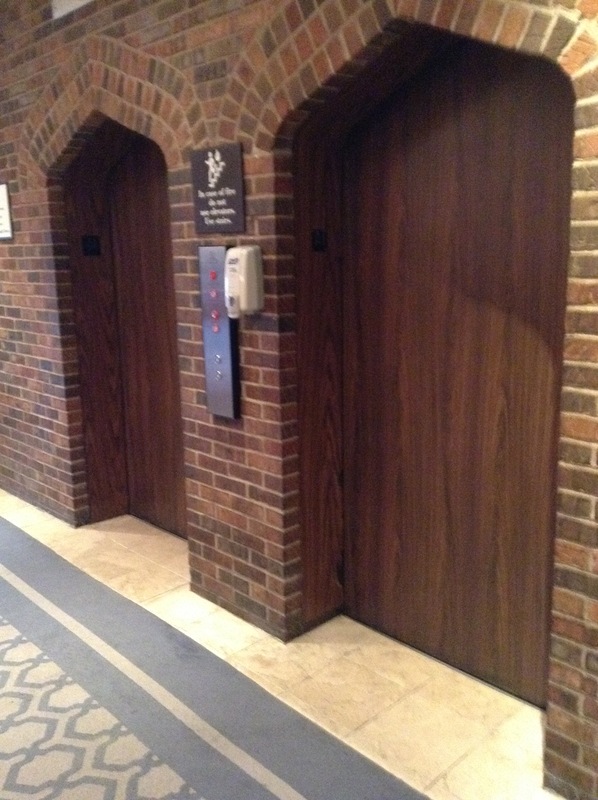 I felt they deserved their own separate entry. There are three new lines coming out later this year (hopefully) that sounded quite intriguing. 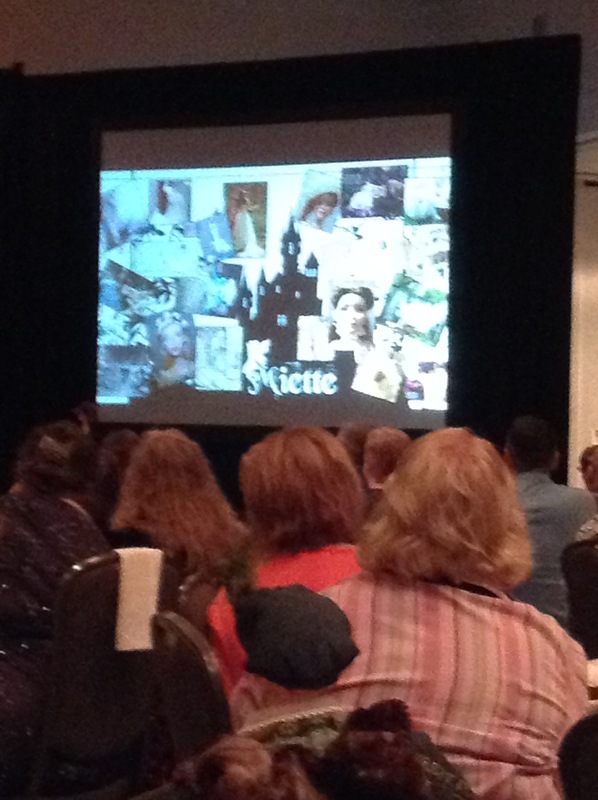 The first one talked about was a new line for Wilde Imagination called Miette. I suppose this new line is the reason the Amelia Thimble line is being retired. (*SOB*). She sounds intriguing. She’s a new face sculpt on the Chic body. She’s the daughter of the mayor of a small town in southern France that can’t be found on any map. The line looked and sounded like it was very inspired by fairy tales as well as old movies such as the Alice in Wonderland movie from the 1930s. 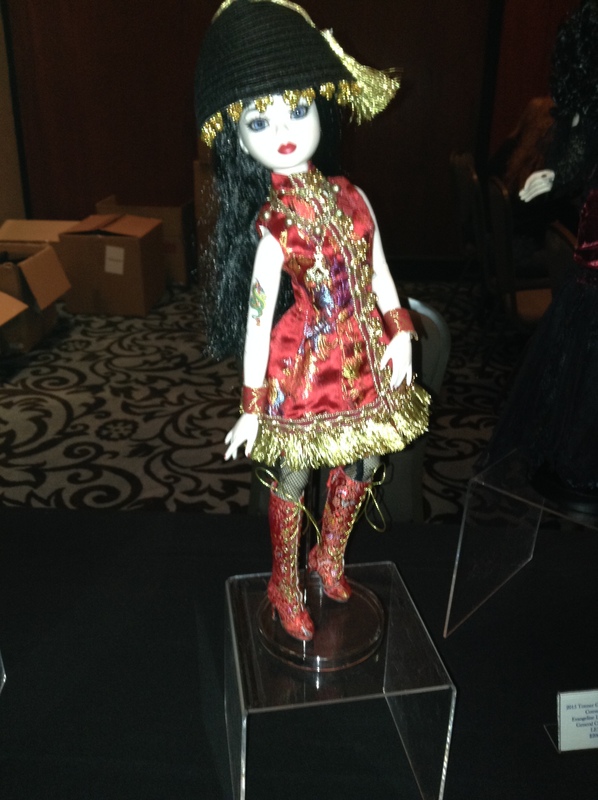 I’m very much looking forward to this line, as fantasy-themed dolls are very much a part of my collection. Not the best photo, sorry! 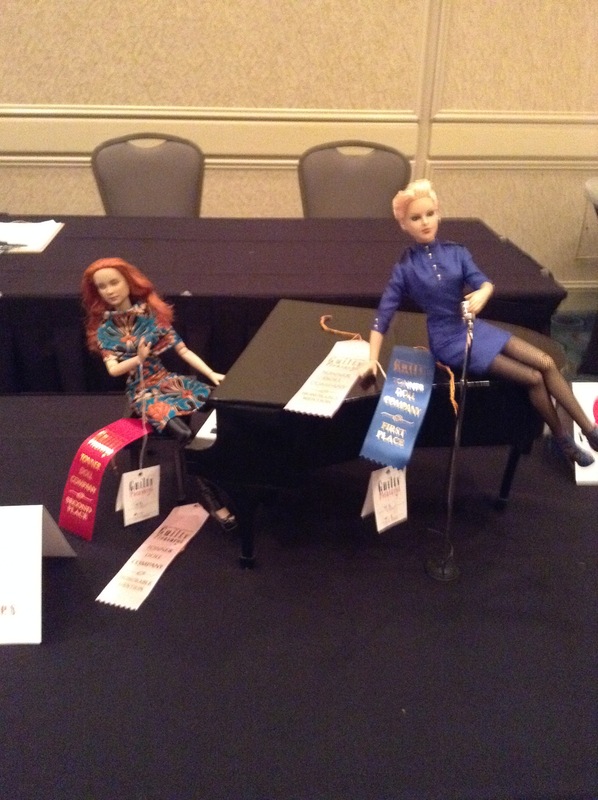 A new line for Tonner, in the same vein as the new Marley Wentworth line, will be the DeeDee Denton line. She is the granddaughter of DeeAnna Denton, the chewing gum heiress. 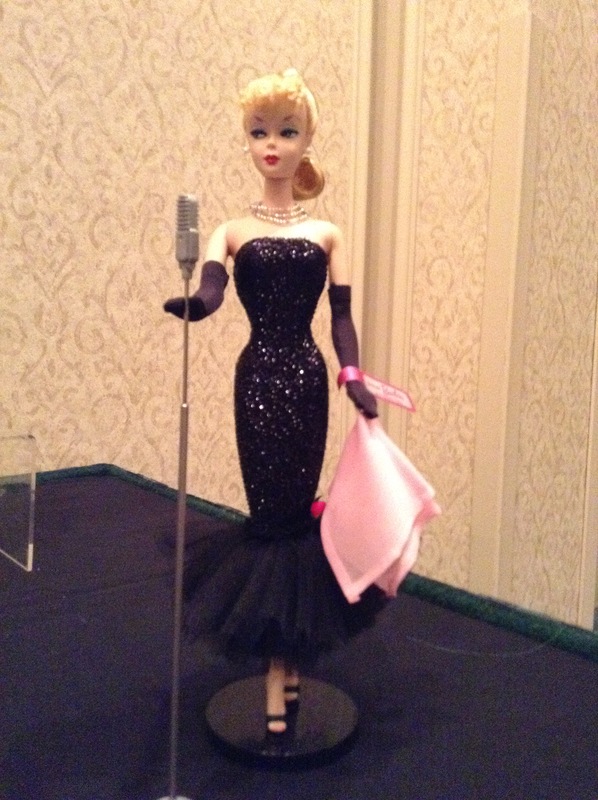 Whereas DeeAnna was a fashion icon of the 1950s, her granddaughter DeeDee is a modern girl — and a reality show star. DeeDee will be on the 17-inch Lara Croft body. 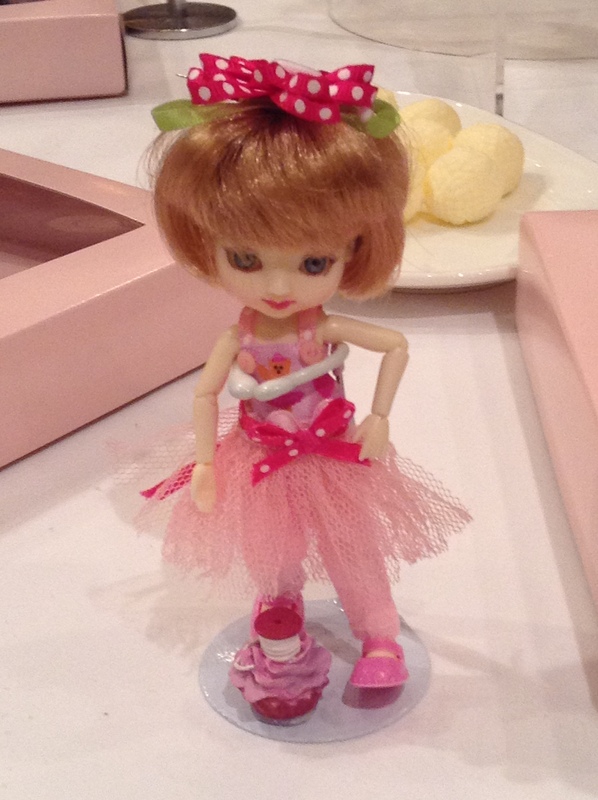 The other new line discussed was Agatha Primrose, described as being “adorkable.” She will be on the Revlon body. 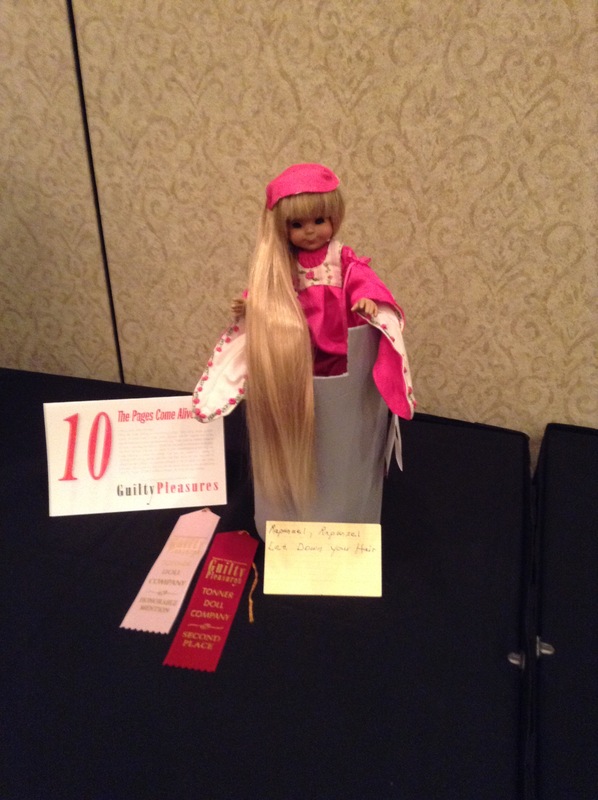 Agatha is a young girl who is into fashion and pop culture. Can’t wait to see this one! 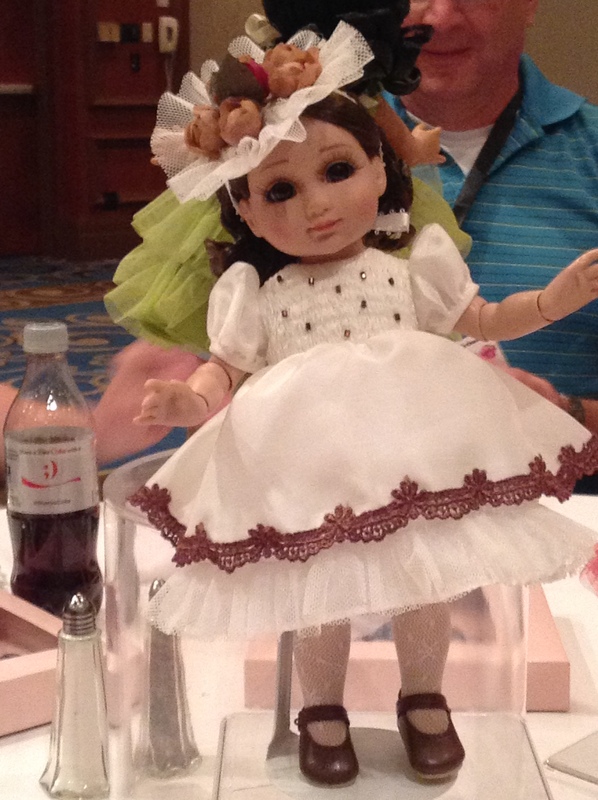 In other news, Tonner will be expanding to mass produce a line of dolls for Walmart and Hallmark, called My Imagination. They are about the same size as the American Girl dolls and can wear the same clothing. 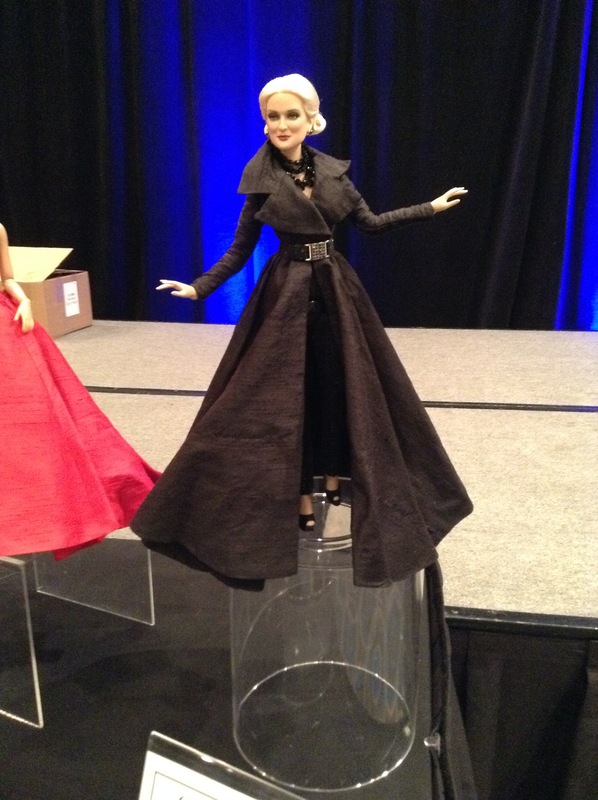 The Carmen Dell’Orefice line has ended with just the one doll. 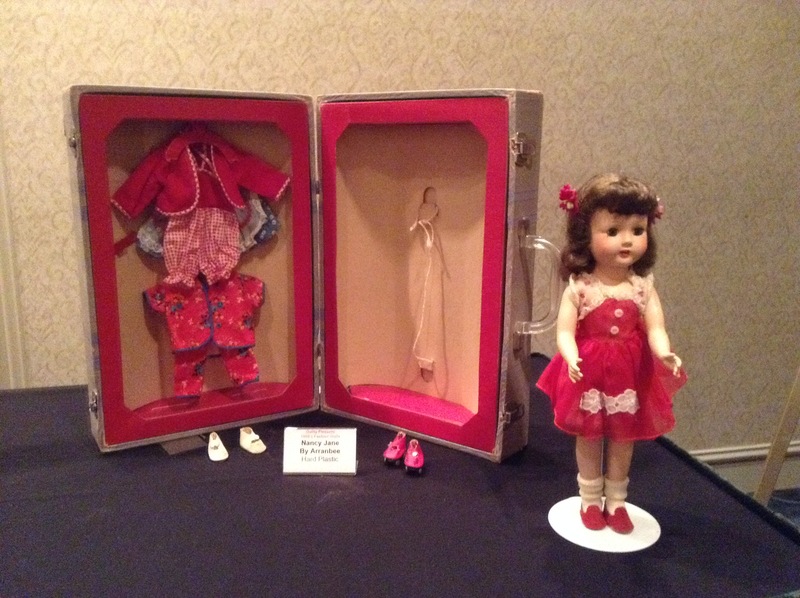 Mr. Tonner said Ms. Dell’Orefice was a lovely person, but hard to work with creatively when it came to fashions for the dolls. 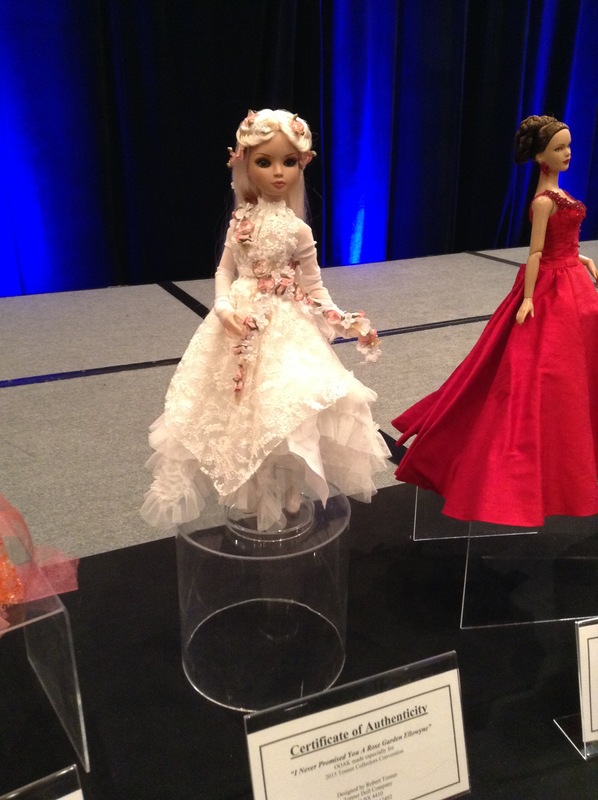 The Harry Potter line will be returning with the large scale dolls, to round out some characters they hadn’t done yet. 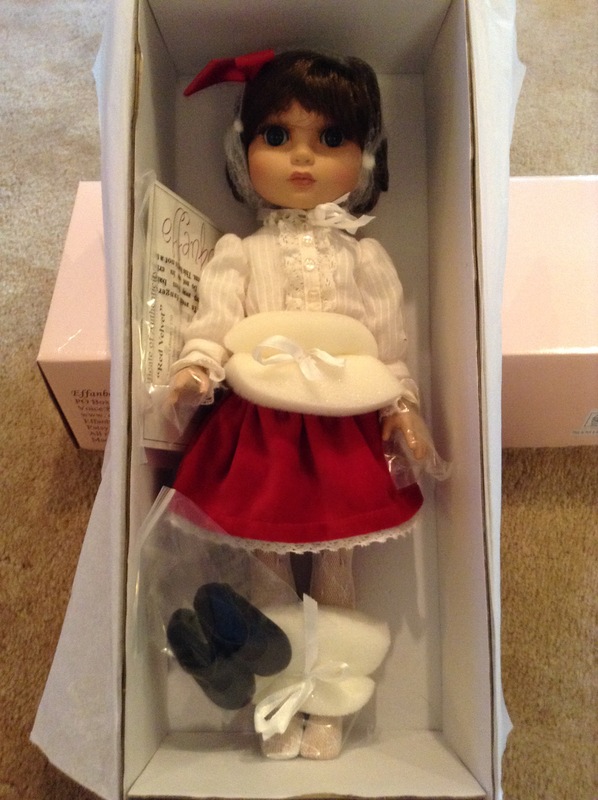 There will be more Gone With the Wind and The Wizard of Oz dolls down the line as well. 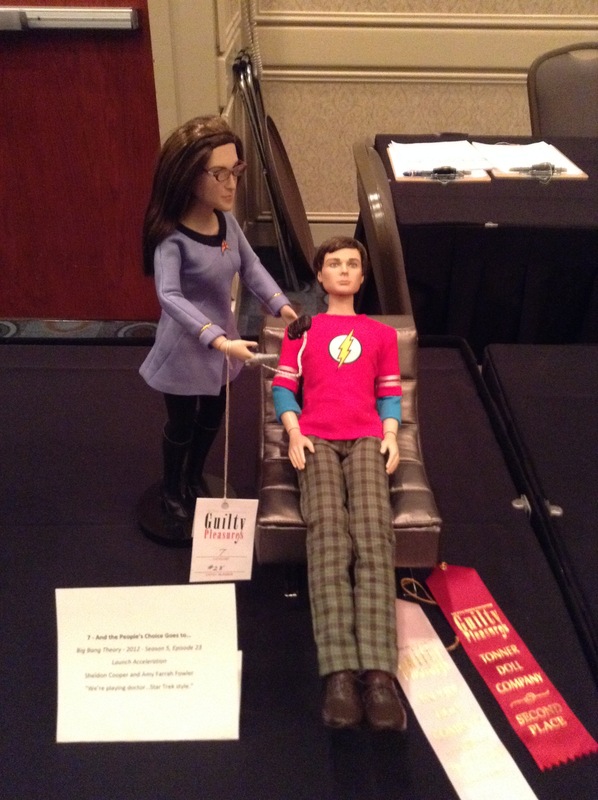 Licensing for character dolls has gotten a lot trickier in recent years, so there probably won’t be as many character dolls from Tonner in the future, although there are plans for more dolls from the DC line and Leonard and Penny from “The Big Bang Theory” will be out later this year. 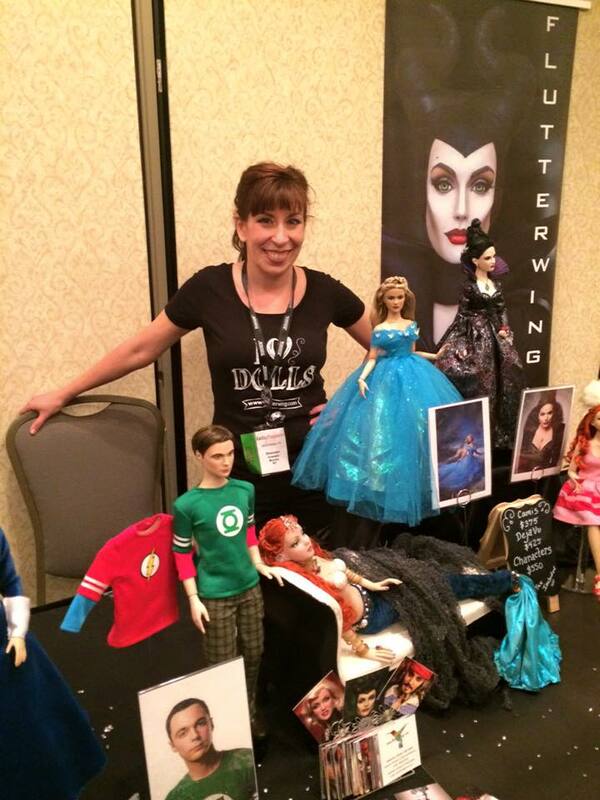 Can’t wait to see what else Tonner Dolls and Wilde Imagination has planned for the future! Our last day all together! I actually woke up feel so sad it would all be over in a couple of hours. 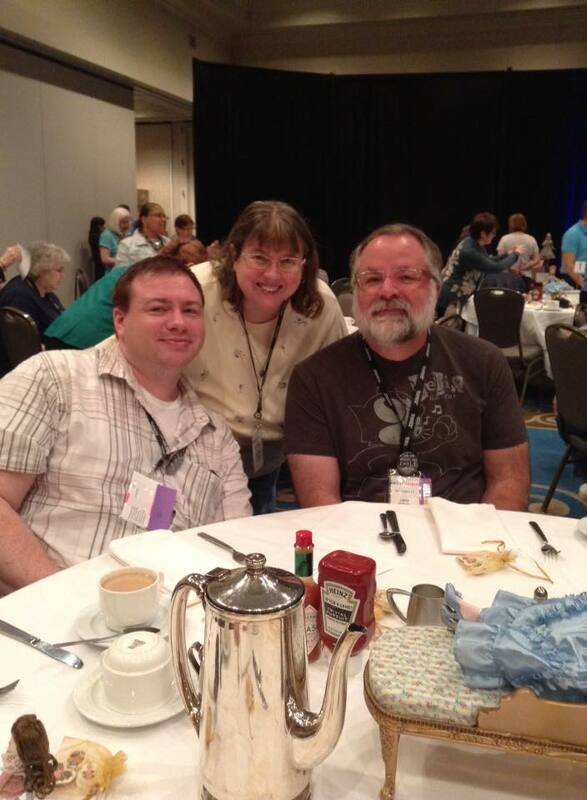 The last event of the convention was a breakfast event celebrating Deja Vu. I’ve loved this line but avoided collecting it because I knew I wouldn’t be able to stop at one. 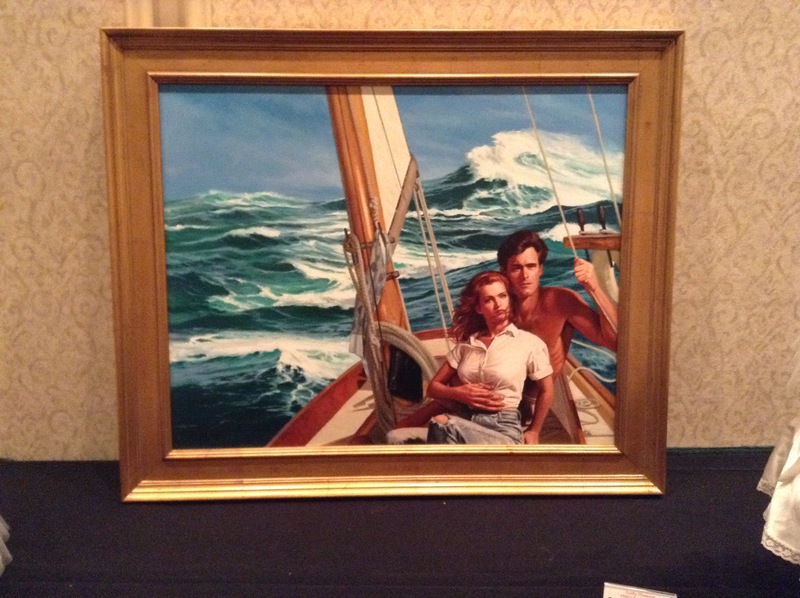 However, the centerpiece was so, so, so very tempting! As the breakfast theme was “That’s a Wrap,” Amelia came dressed in her own lacy wrap. 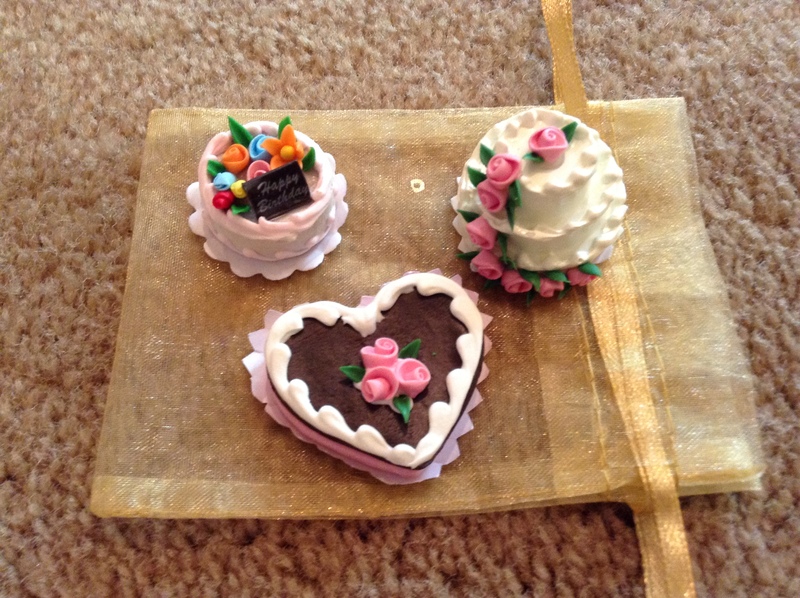 The table favor was a gorgeous collection of dolly-sized cakes and sweets. They looked almost good enough to actually eat! Breakfast was eggs, hash browns, bacon, sausage, fruit and yogurt. Well, that’s what I ate. There was plenty of cereal, pastries and other assorted noms for the first meal of the day. 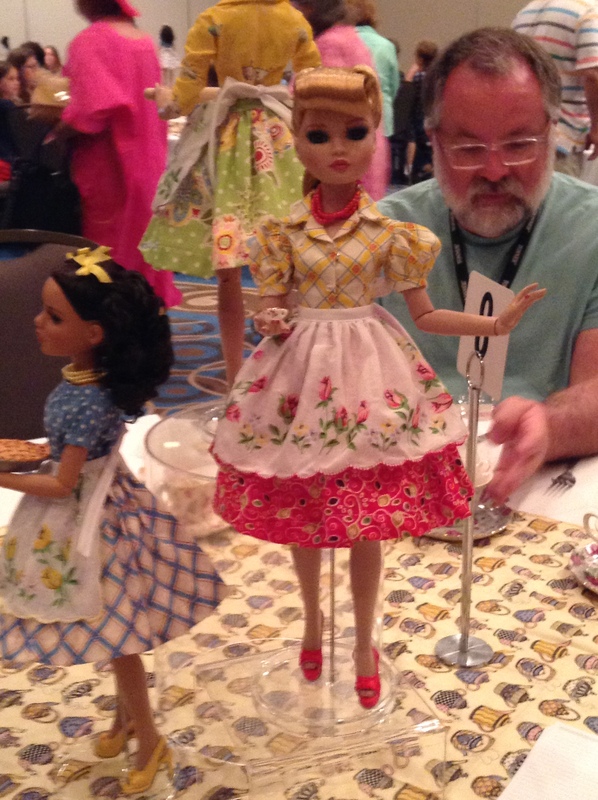 Mr. Tonner held a Q&A session about upcoming and current lines and then it was time for the charity auction! 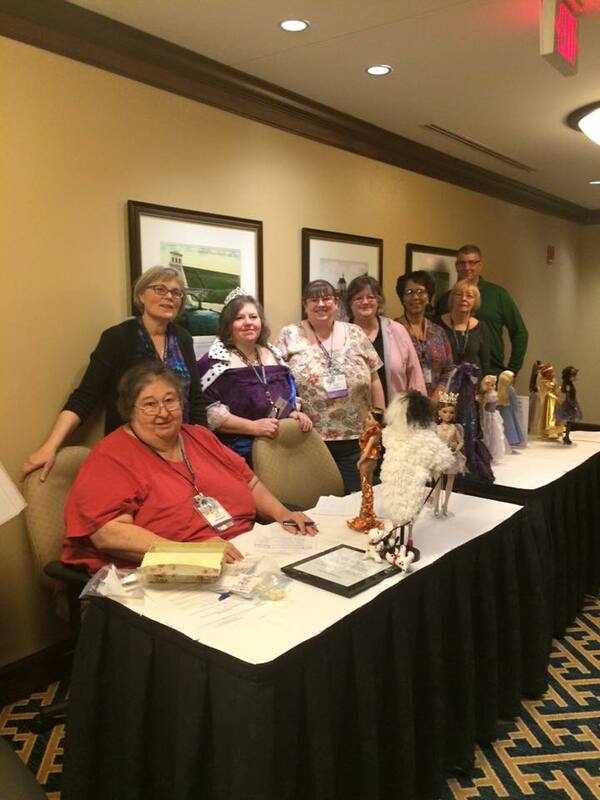 At every convention, several one-of-a-kind dolls are offered to the highest bidder, with all the proceeds going to one of the charities the company supports, A Friend’s House, a facility to help women struggling with various issues. 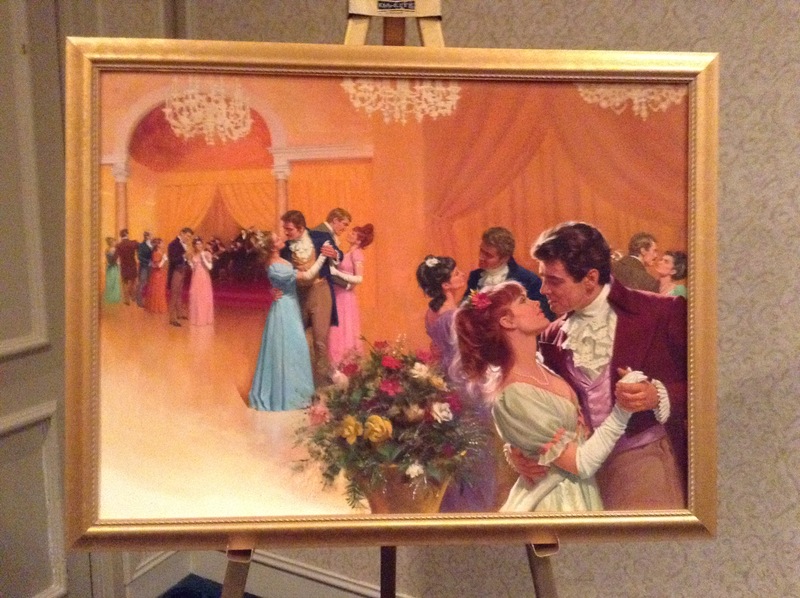 I’ve never participated in one of these auctions, but I loved I Never Promised You a Rose Garden Ellowyne, so I thought, why not? 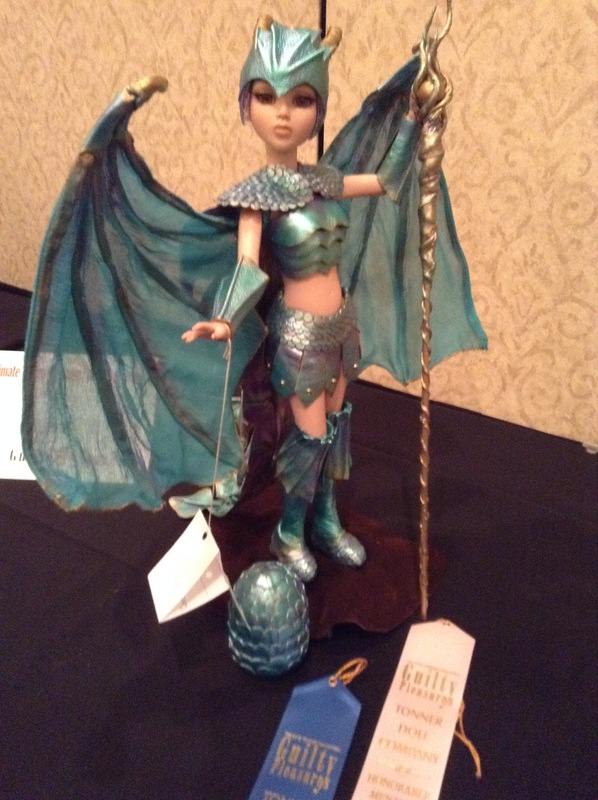 I bid $400 for her, though I was pretty sure she would go higher. Sadly, she did. 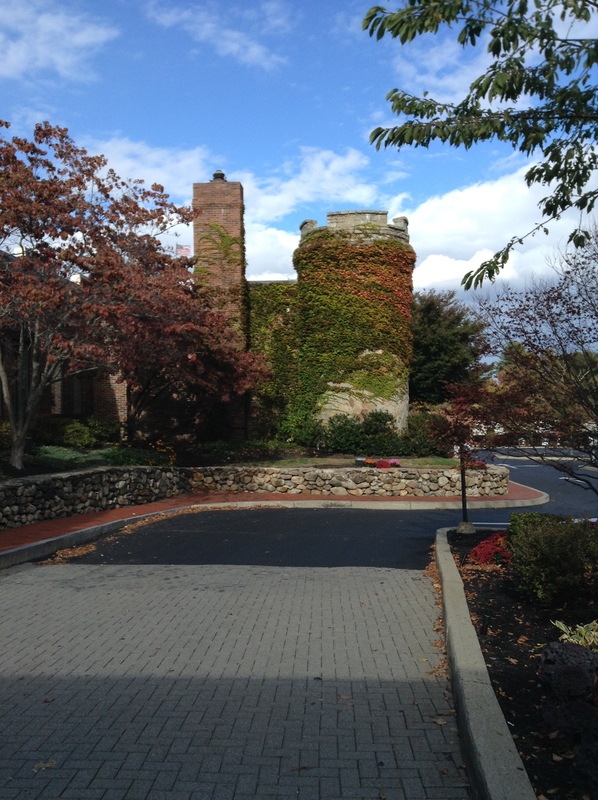 (Though not sad for A Friend’s House!) 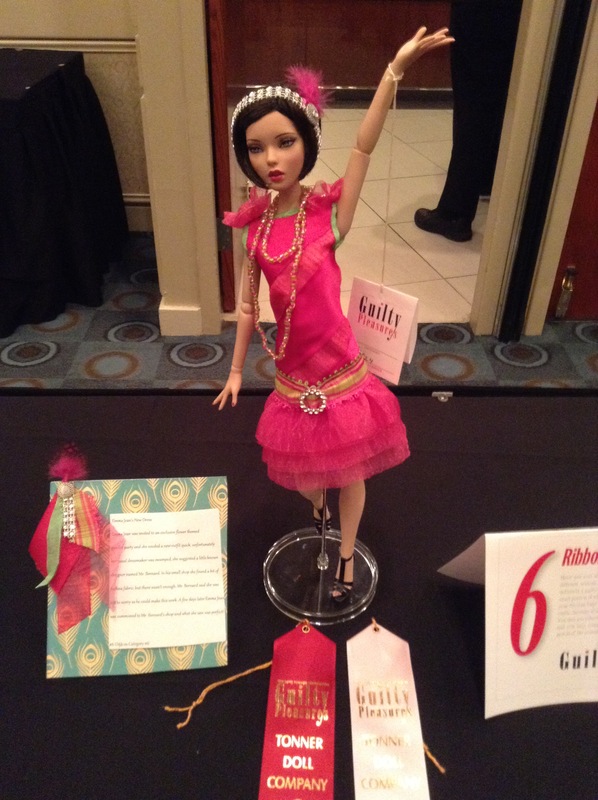 Bidding was fun! Though I really should not get into the habit of doing so. 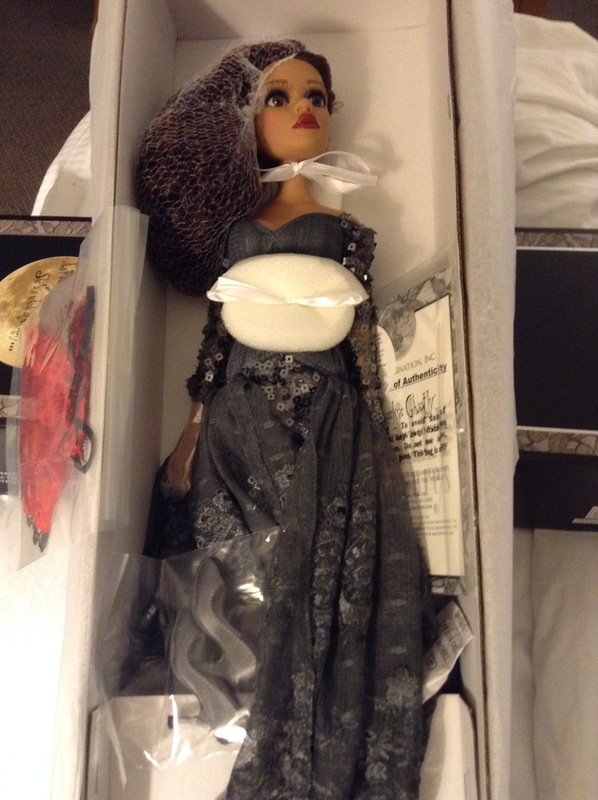 Then, sadly, it was time for farewells and one last trip into the Tonner sales room. But much to the relief of my bank account, I didn’t buy anything. Thomas graciously helped me box up most of the goodies I had gotten over the weekend and helped me carry them down to the UPS shipping desk to send home. But a couple were small enough to go in the suitcase on the plane! Thomas, Lance, Shannon and I said our goodbyes, then the boys took Shannon to the airport as her flight was leaving that evening. I had booked a flight home for the next day, as I hadn’t wanted to be too stressed about attending the last event, packing and getting to the airport. 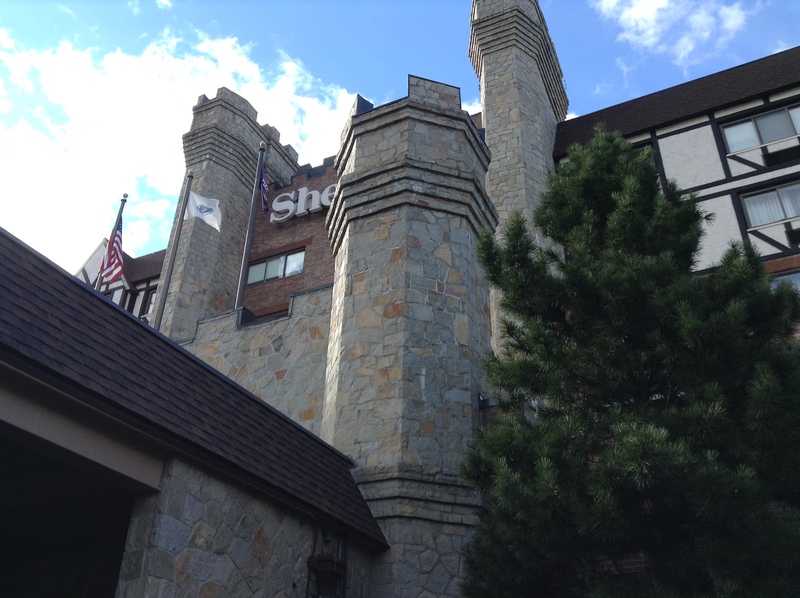 So I spent the afternoon in my hotel room, packing my crap. To my great surprise and delight, around dinner time, Thomas and Lance came back to the hotel to kidnap me for a quick bite to eat. We went to the mall across the highway for Five Guys Burgers and Fries, a place I had always wanted to try, but had never gotten the opportunity. (The curse of living in a small town!) Burgers were good, fries were meh. Then it was time for goodbyes, again! Spent the evening watching reruns on TV, hoping I could get a good night’s sleep for my flight home the next day. 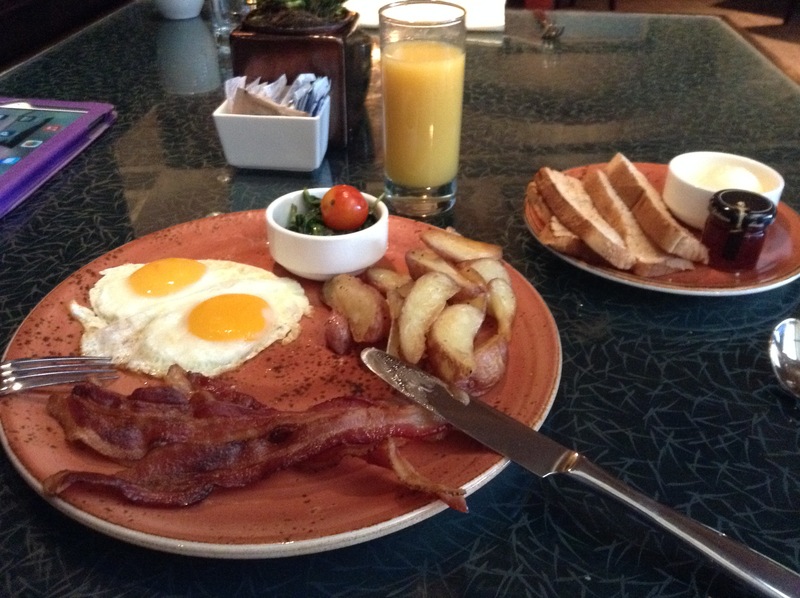 Woke up early and nervous about having to get to the airport by myself, but I did treat myself to a scrumptious brekky in the hotel restaurant. Can’t eat like this every day! Finished packing and checked out of my room around 11. The hotel staff got a taxi for me, and I got to the airport with three hours to spare before my flight. Oops! Spent the time mostly people watching and playing musical gates for my flight. 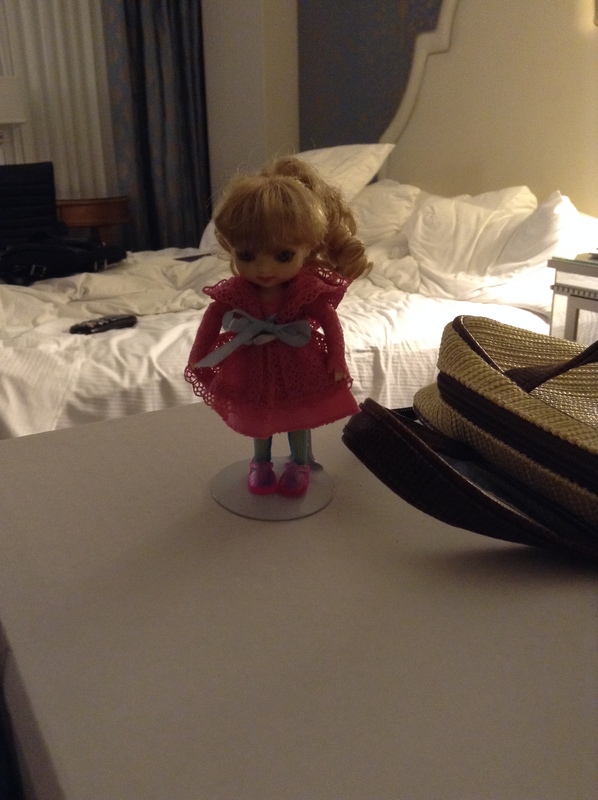 Amelia and I said farewell to Dallas and made it home safely without any bumps or mishaps along the way. 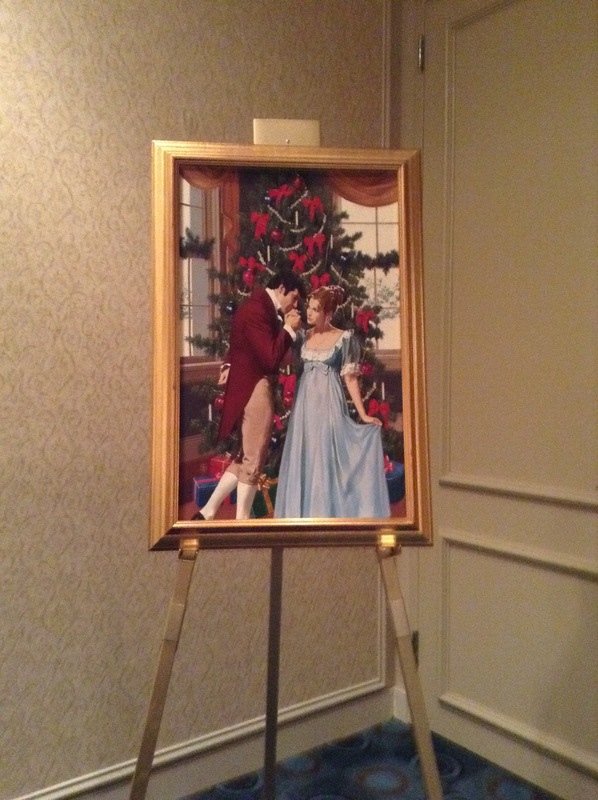 I had such an AMAZING time at TonnerCon and I’m so glad I went, despite all the anxiety I had about getting there. I’m really looking forward to the next convention and seeing everybody again! I was surprised that there weren’t as many competition entries this year as I have seen in the past, but as this was a smaller, more intimate crowd, I suppose that was to be expected. 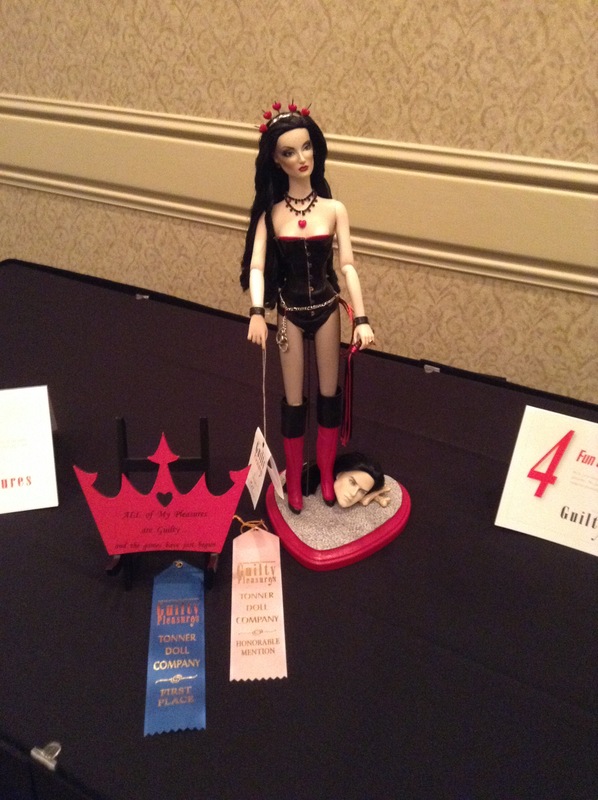 When the competition categories were announced, I had contemplated entering one or two, but due to my various illnesses in the months leading up to TonnerCon, I couldn’t really be bothered. 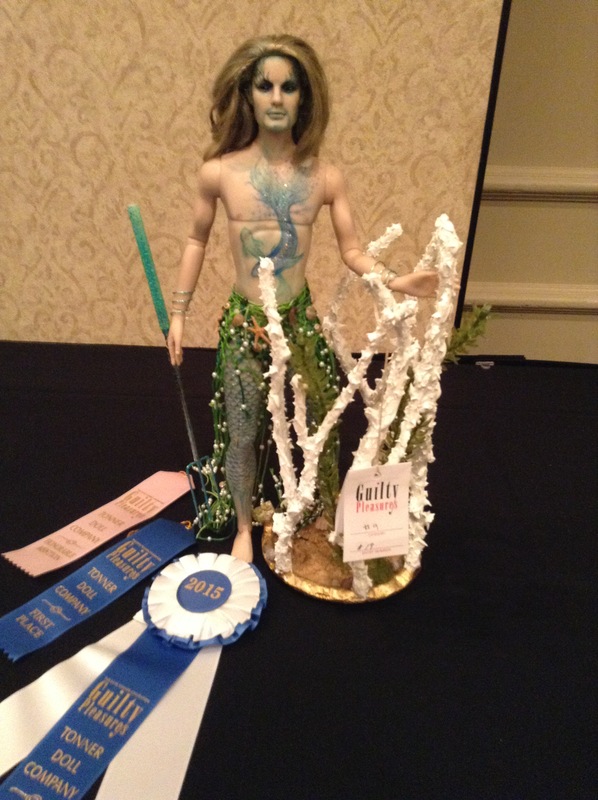 The entries into the competition categories were amazing as usual. I had to take pictures of everything! 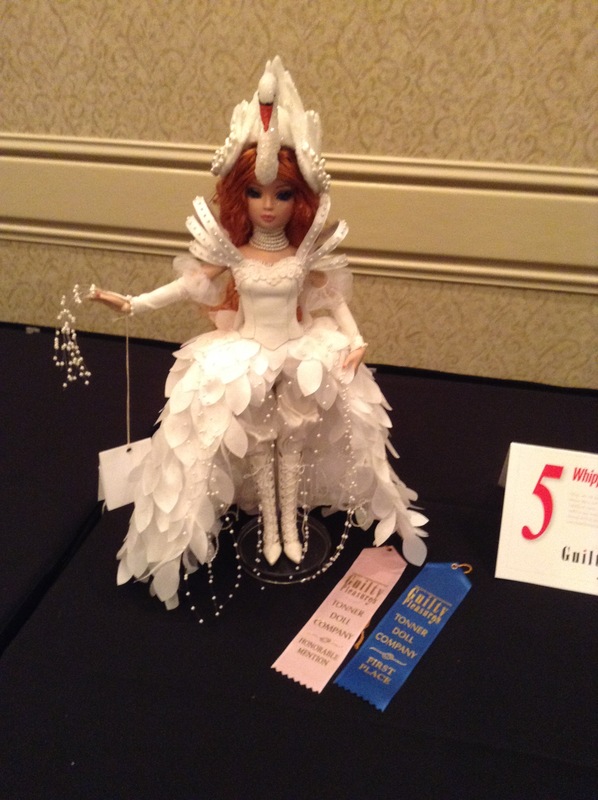 Another entry in the ribbon category. 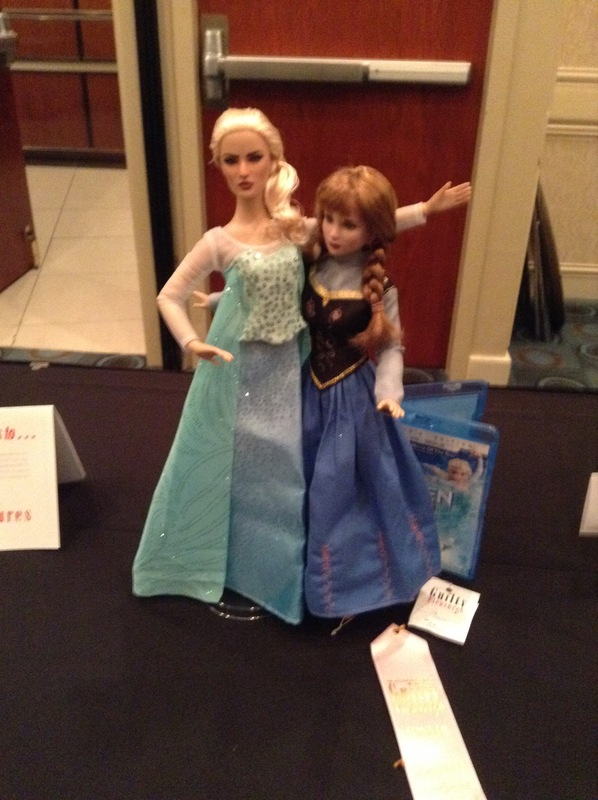 Of course there had to be a ‘Frozen’ entry! Playing doctor — Star Trek style. 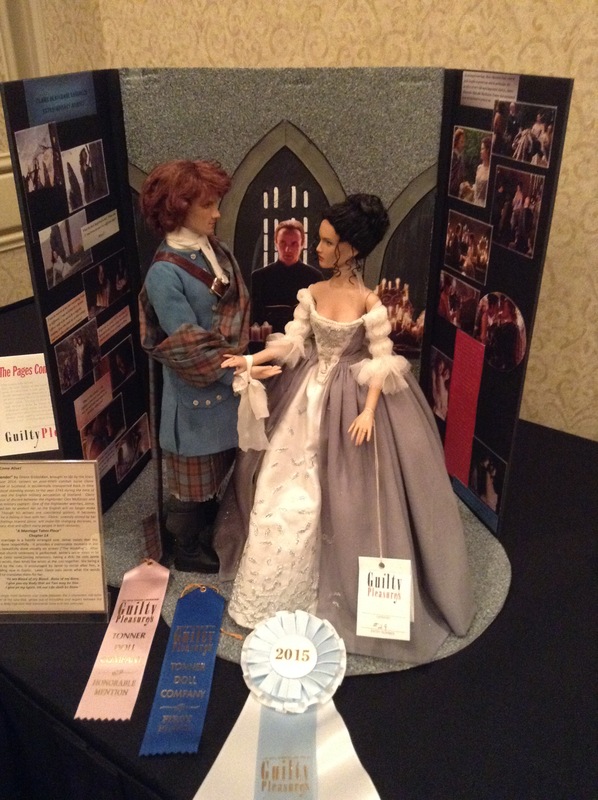 Thomas’ gorgeous vignette! Love the piano! Ellowyne as a Swan Queen. 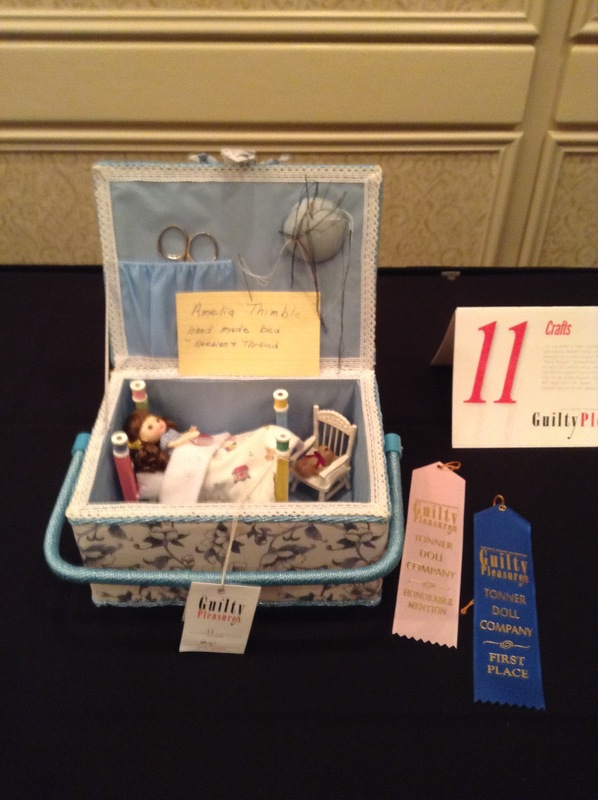 Cute cute entry into the craft category! Rapunzel, letting down her hair. LOVE the body art on this guy! So much talent on display! 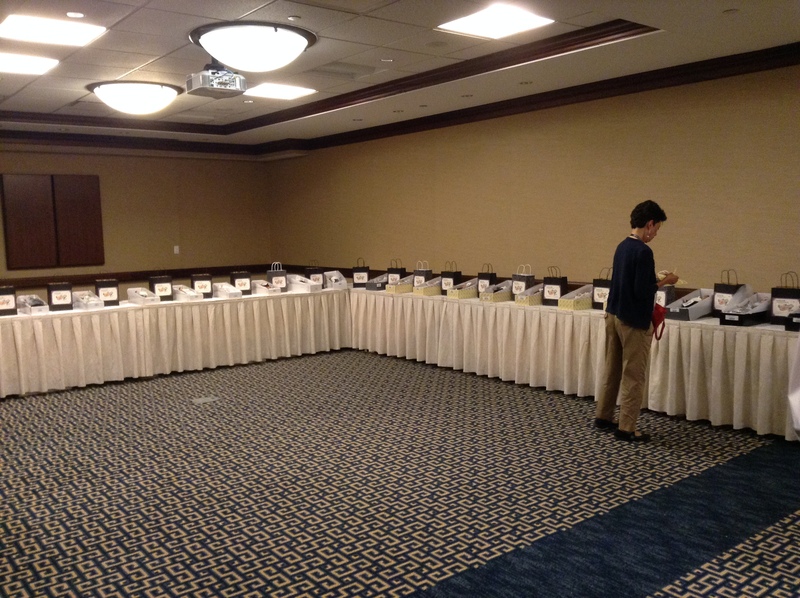 The competition room is something I really look forward to during these conventions! The bad storms that had been plaguing Texas recently continued into my second night in Dallas. Which caused me to oversleep and missed the opening of the Tonner sales room on Saturday morning. I missed out on an Ellowyne outfit I’d wanted to snag, but no biggie. 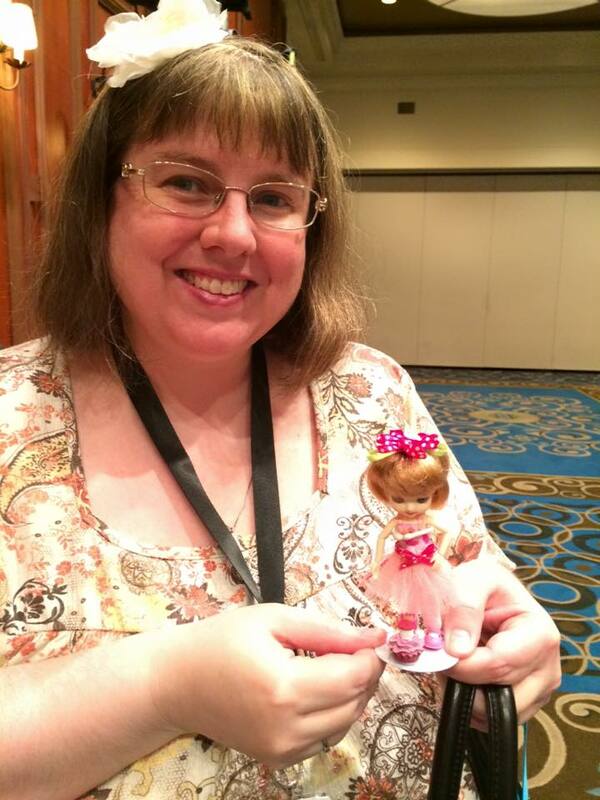 I picked up the fabulous Jupiter Ascending doll (crappy movie, beautiful costuming) and “Pretty Sad” Sad Sally. After a quick danish and OJ breakfast, I hung out with Shannon in the vendor room for a bit before it was time to hit the next event: Cupcakes and Crimson! 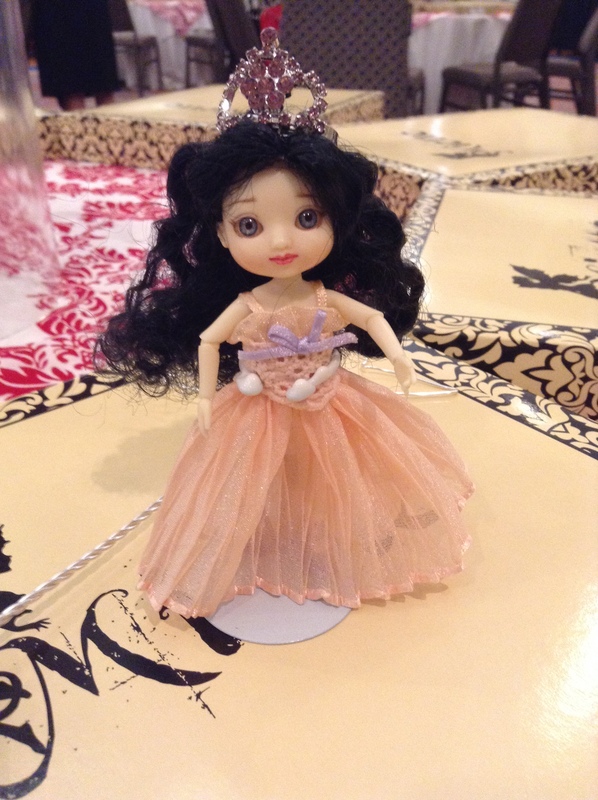 Amelia was dressed for the occasion, and even brought her own cupcake! 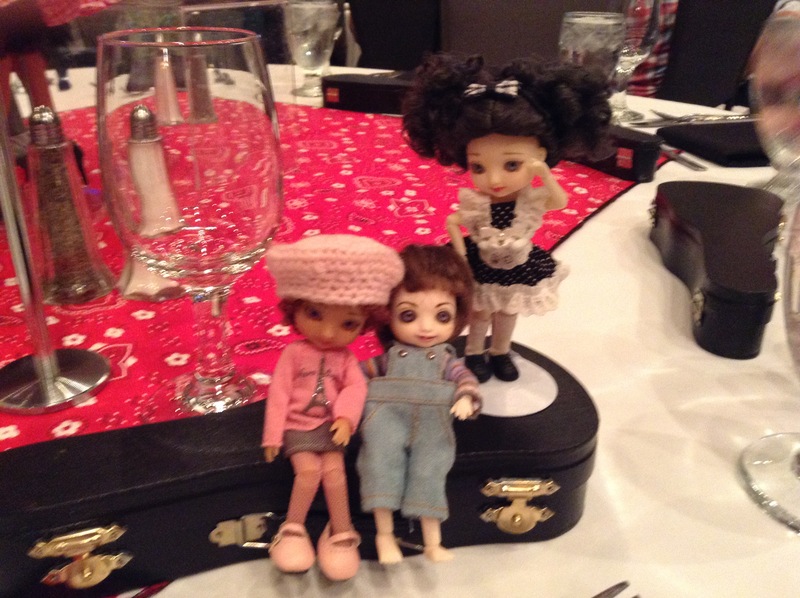 The Cupcakes and Crimson brunch was a breakout event starring Patsy and her friends, Trixie and Aggie. 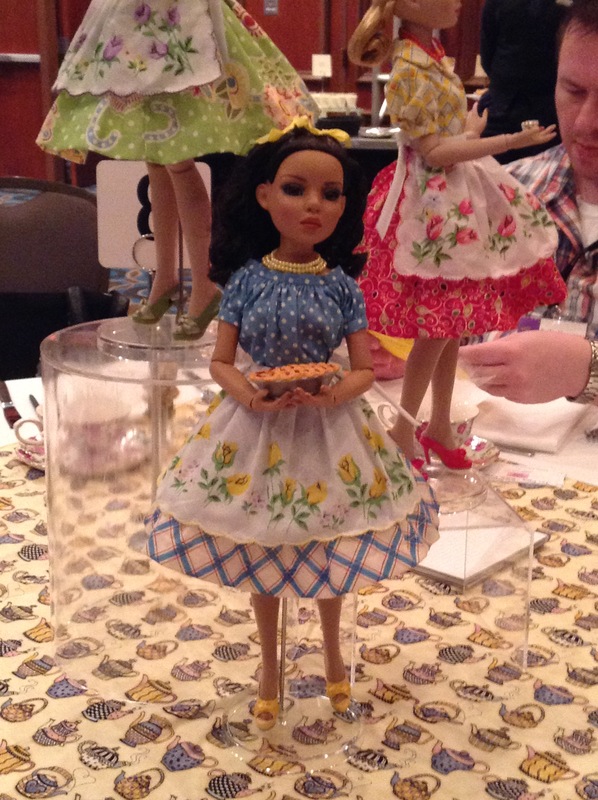 The centerpiece was achingly sweet and I wanted to take them home with me, but I resisted. I did NOT need yet another line to collect! 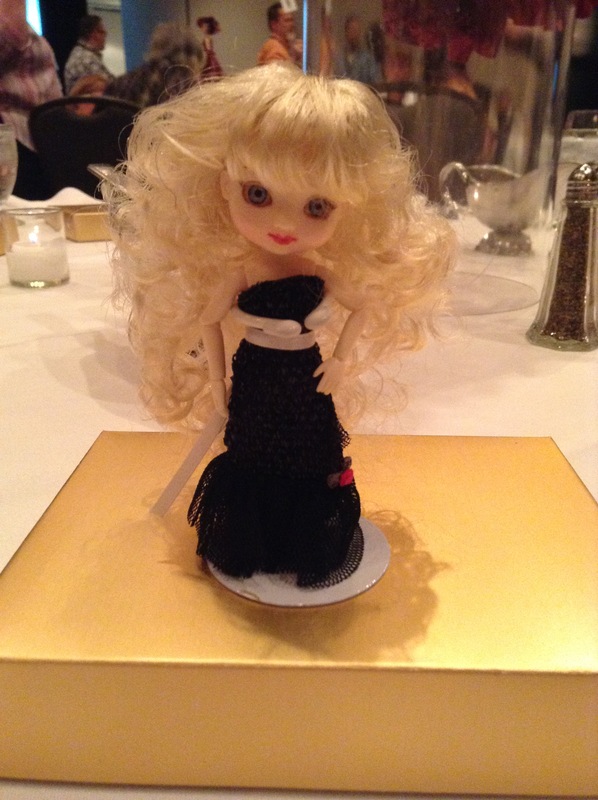 The table favor was the cutest little Patsyette dress, Sheer Delight. Which is what I was in when I learned the outfit can also fit Sad Sally, as I do not own any of the cute-cute Patsyette line. Lunch consisted of fried chicken, cole slaw, potato salad, a biscuit and a slice of red velvet cake. We thought it odd there were no cupcakes at the Cupcake and Crimson event, but we soon learned why we had been given red velvet cake instead. 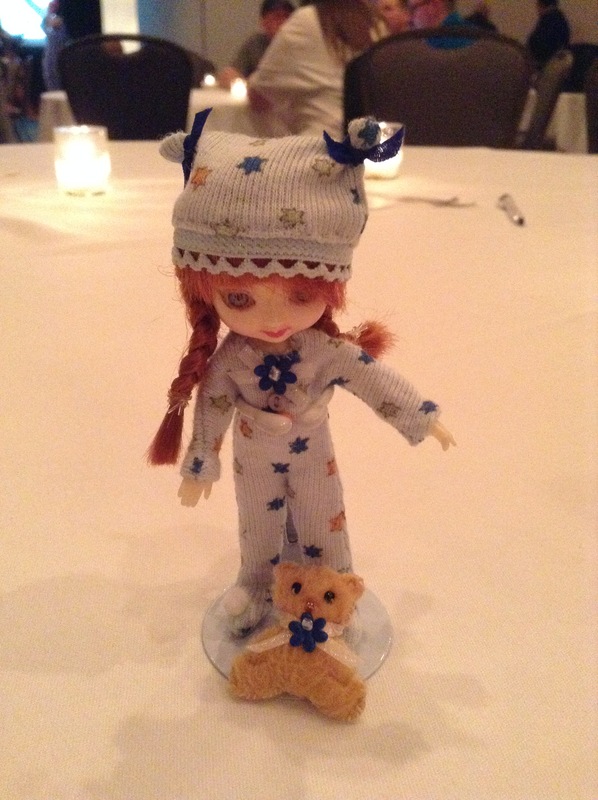 Because we were gifted with the Red Velvet Patsy doll! She’s a new size for Patsy, 14 inches as opposed to her usual 10 inches. And every bit of her is adorable! 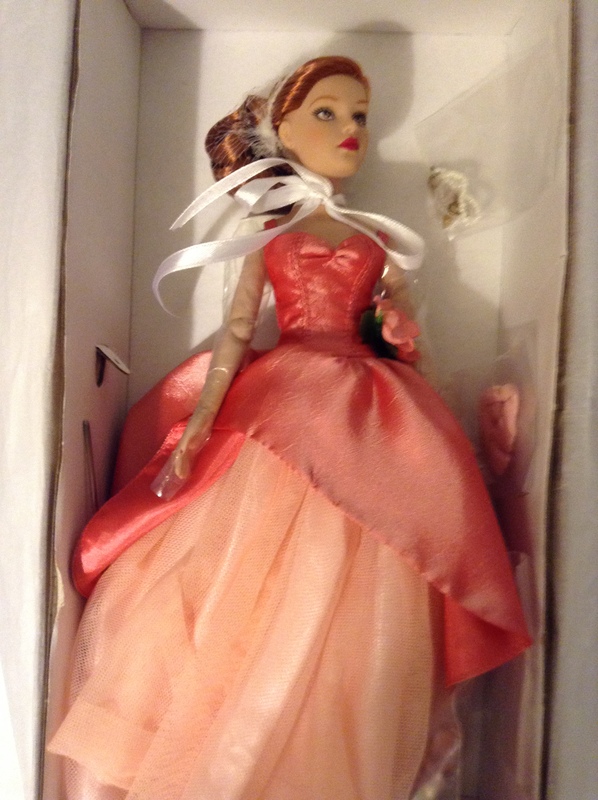 But since I don’t collect Patsy, I knew I would have to part with her. 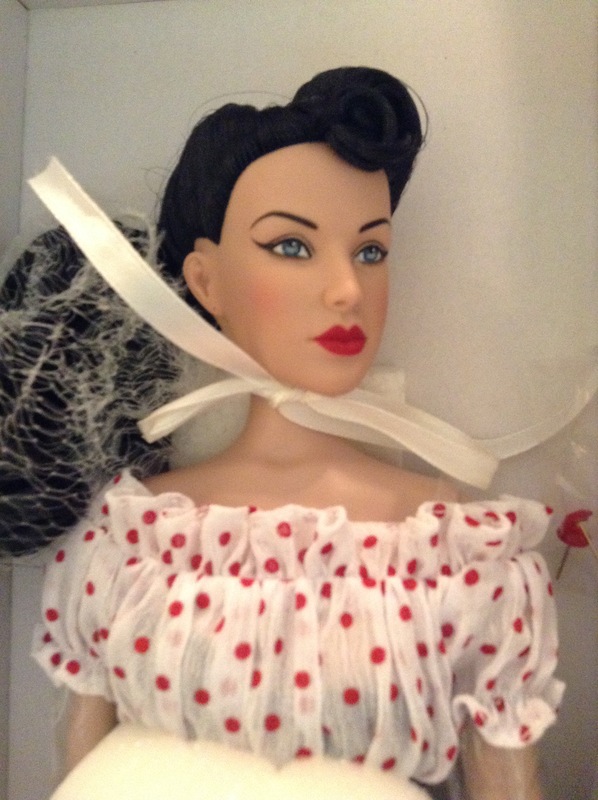 Fortunately, one of my dear friends does collect Patsy and she is on her way to her new home! After lunch, I visited both the competition room and special exhibit room. 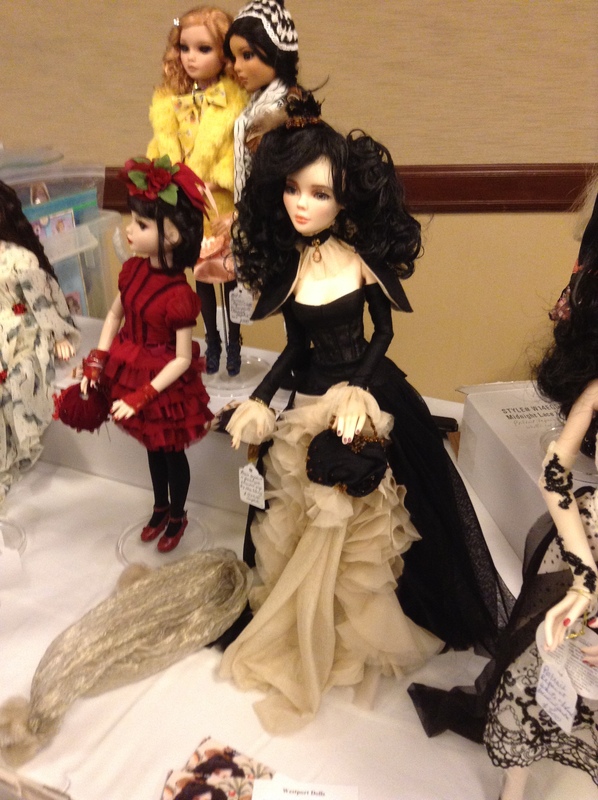 There were so many beautiful dolls on display, I will need to give them their own entry! So many pictures! 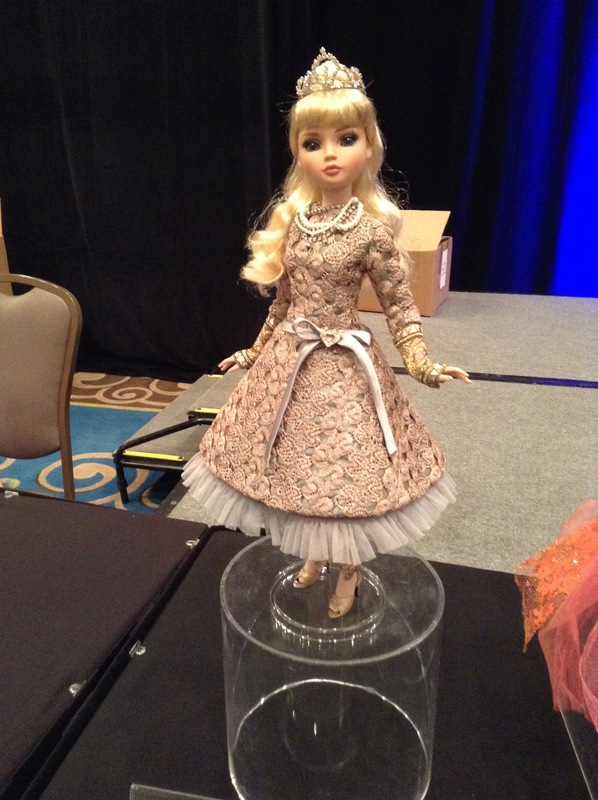 Stopped by the Raffle Room to pick up my tickets and decided to swing into the Tonner sales room to pick up a stand for my new Angelique, since I always forget to buy them with the dolls. At least, that was my intention. Went in to buy a stand, came out with two stands, two dolls and an outfit. My poor credit cards! But look who came home with me… Tiny Kitty! This was the big dinner event. 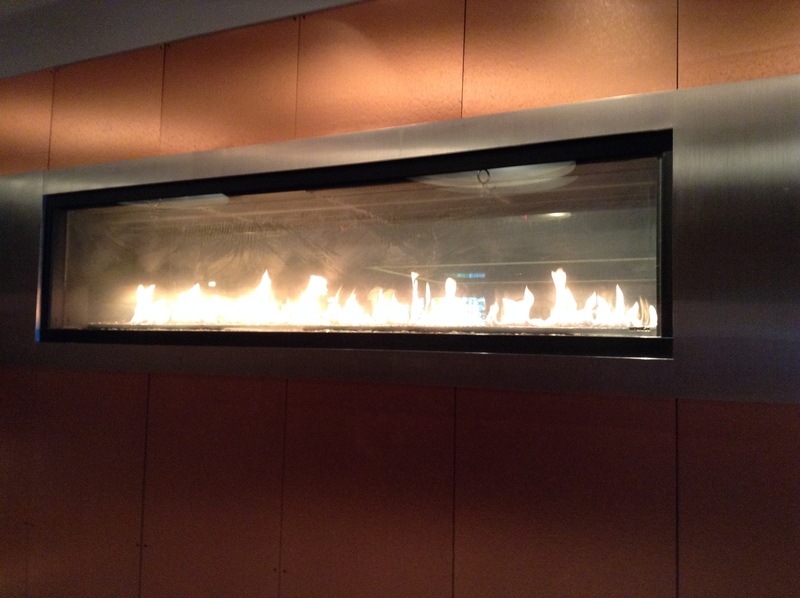 And what a dinner it was…. roast beef, potatoes, salad and the most delicious chocolate torte I believe I’ve ever tasted. 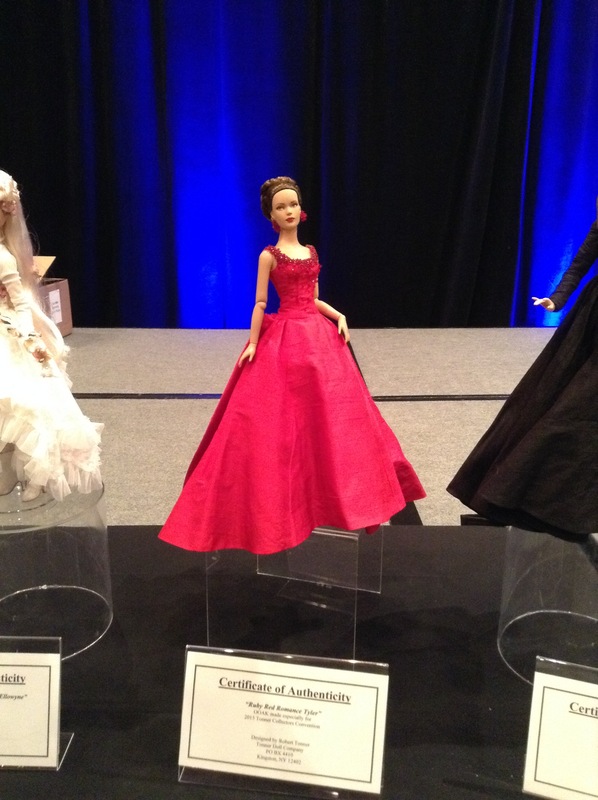 The centerpiece was Marley’s Grand Entrance, the first appearance of an adult Marley Wentworth doll. And she was stunning. So, of course she came home with me. 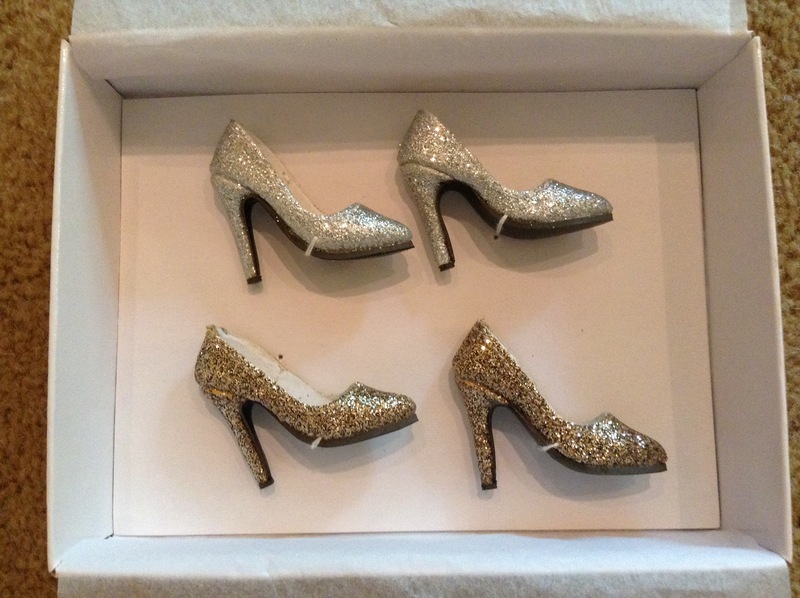 Our table gift was a delightful box of glittering shoes to fit the Marley/Antoinette lines. 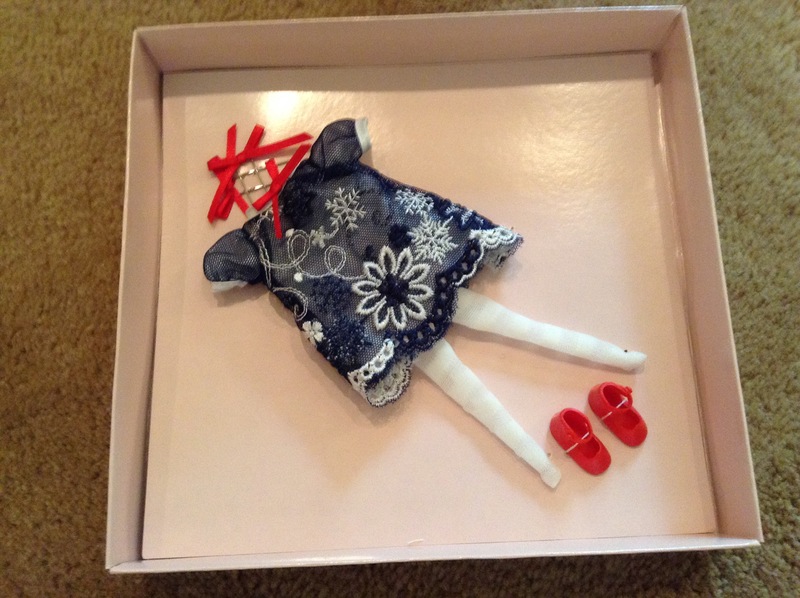 I hate shoe shopping… unless it’s for my dollies! 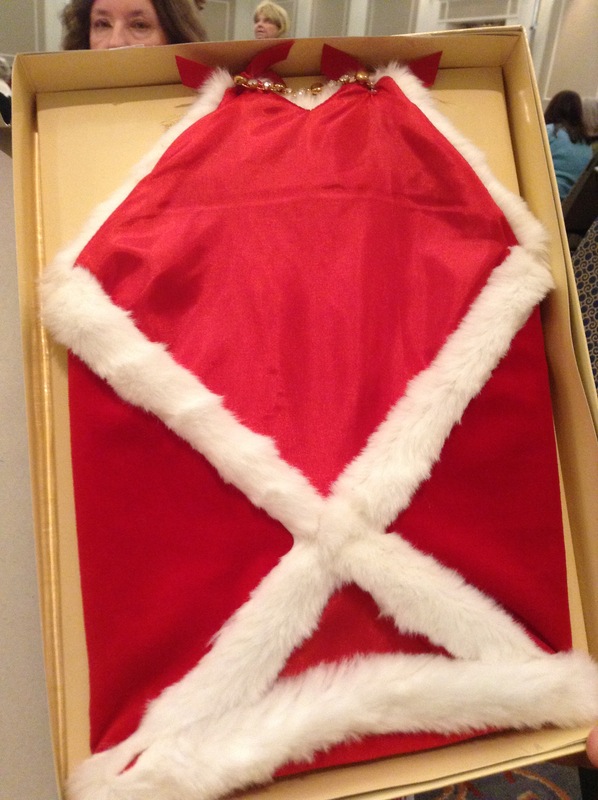 Then… it was time. Time for the big reveal! 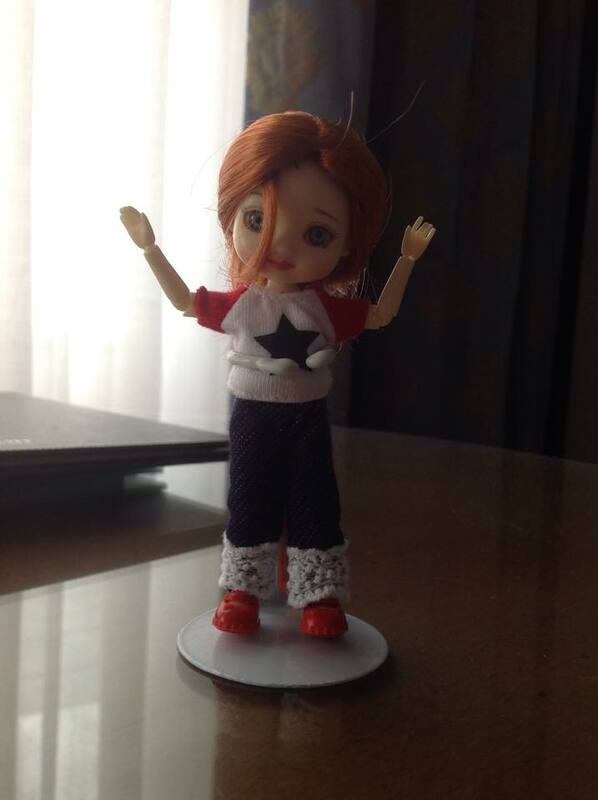 The souvenir doll! What we had so eagerly anticipated! Marley’s Mad for Accessories Gift Set. Two outfits, two wigs, two pairs of shoes, a purse, sunglasses, lingerie, and extra hands for posing! 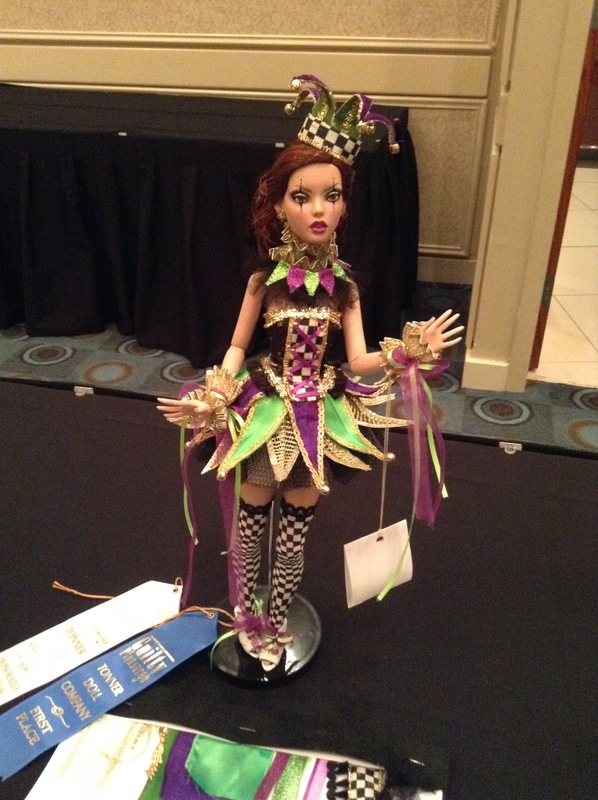 Everyone was totally blown away with this girl! She’s not even my style and I was in love! The Tonner company really outdid themselves this year! After the dinner event, we only had half an hour to get upstairs and get changed into our pajamas for the PJ Dance Party! Though, I have no idea why I ever thought I could get both myself AND Amelia dressed in half an hour! A DJ duo provided the tunes and there was dancing to be had! Though, I am NOT a dancing person. But it was great to hang out with friends and get excited for the raffle drawings. I did not win anything this year, though. Alas! The PJ Dance Party continued, but Amelia and I were too pooped to pop, so we headed upstairs, a little bit melancholy that there was only one day of TonnerCon left. Last year, 2014, was a dolly dearth for me. My mother and I were invited to celebrate ‘Christmas in July’ with her family in Sydney, Australia, so that ate up all my vacation time, not to mention monies! 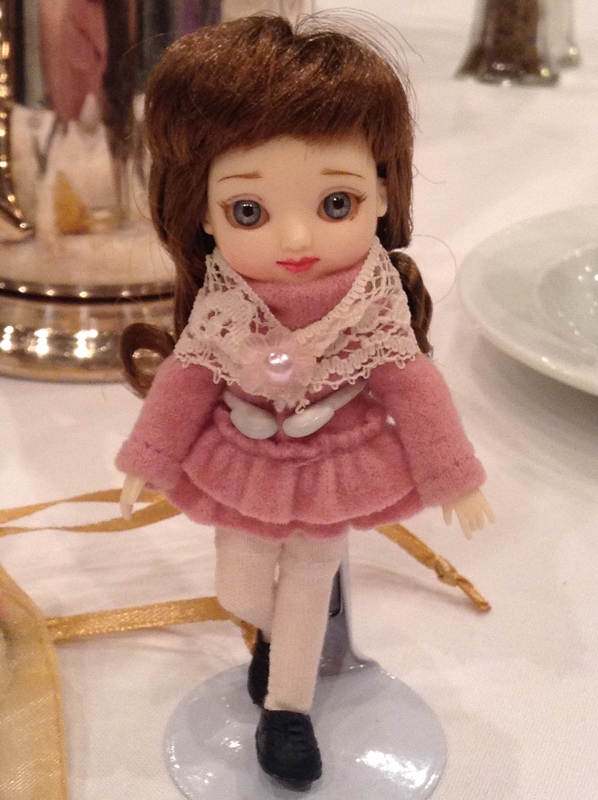 Thus, I was unable to attend any dolly events last year. 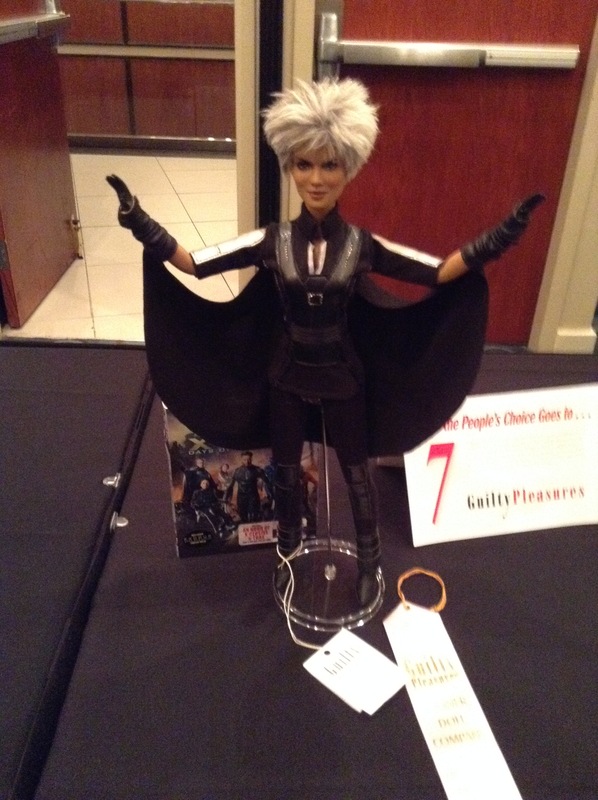 Therefore, I was extremely excited to attend the 2015 TonnerCon: Guilty Pleasures, held at the lovely Hilton Dallas Lincoln Centre hotel in Dallas, TX! 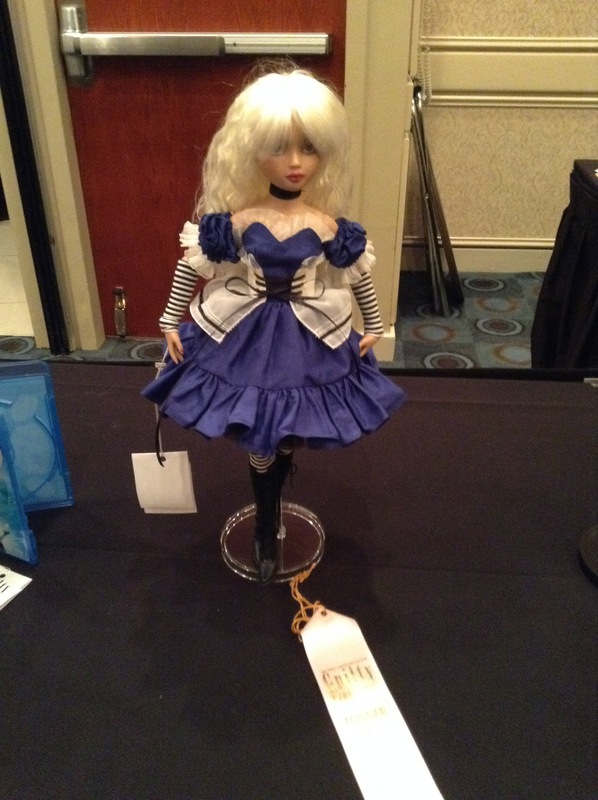 I was SUPER nervous to go, as it would be the first doll event I would be attending by myself. Previously I had dragged one of my parents along with me (mostly to drive me, heh), but this time, due to circumstances, neither could attend. So I would be flying all the way to Texas on my own. Now, it wasn’t the first time I’d traveled on my own — I’d flown to Texas and Japan all by my lonesome previously. But, it was the first time I’d be traveling on my own after being diagnosed with two conditions that could be debilitating. Thankfully, I had my own little cheerleading squad in the form of Thomas Lake and Shannon Craven. I couldn’t have managed as well as I did without them! After getting up at the ungodly hour of 3:30 a.m. to get to the airport by 6, it was smooth sailing — or should I say, flying — to the Lone Star state. I managed to time my flight to arrive within 20 minutes of Shannon’s arrival to Love Field, and Thomas was able to pick us both up to take us to the hotel. After meeting up with Lance Goforth and a delicious Mexican lunch, we were Lincoln Centre bound! Check-in went smoothly and Amelia and I were finally able to get a little rest before meeting up with the others for dinner. 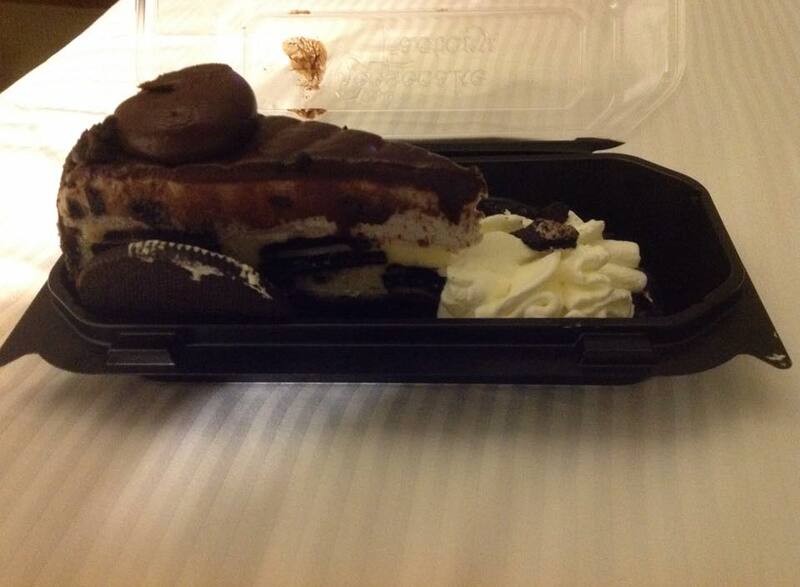 At the Cheesecake Factory. Like you do. I needed to get some sleep because I had been up way too long and I needed to get up early to see if Shannon needed at help setting up her booth in the vendor room the next morning. 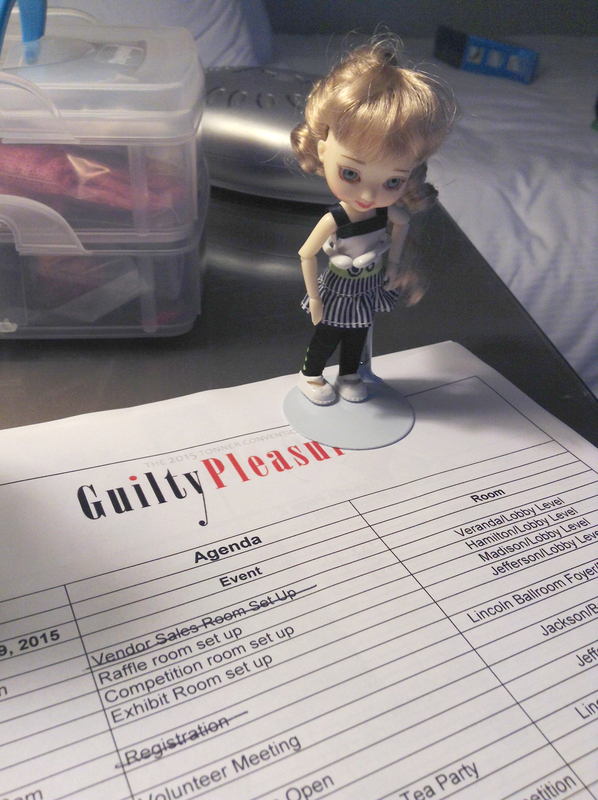 But not before we had another quick look at the agenda. Morning came around way too quickly for my liking, but it didn’t really matter. 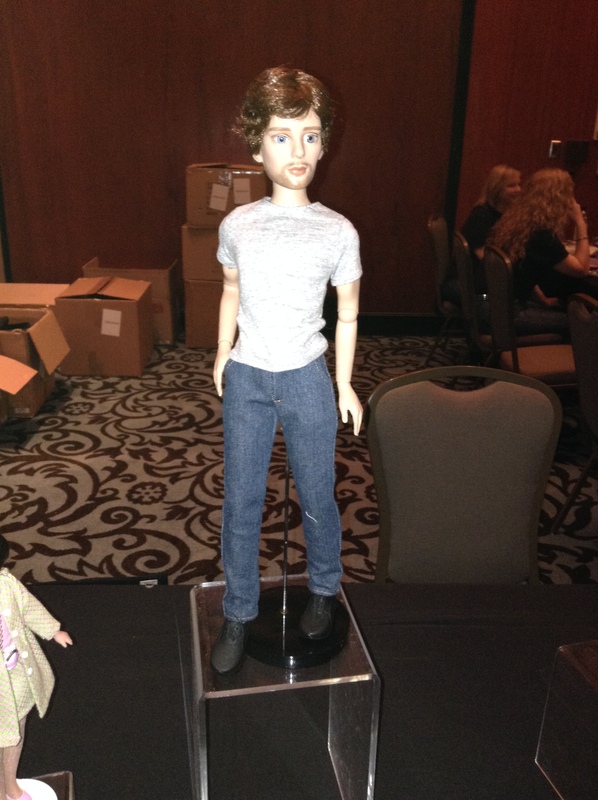 It was finally time for TonnerCon! Went downstairs to help with Shannon’s display, though I mostly just fetched and carried. 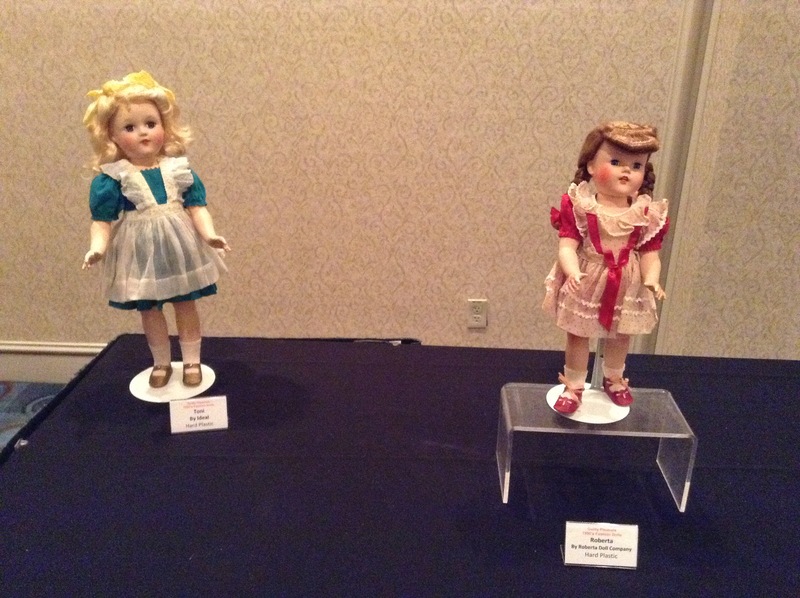 But I got to touch her amazing repainted dolls. Oooh! Then it was time for registration! Aaaah! Our convention bags were a beautiful basic black, and quite roomy. 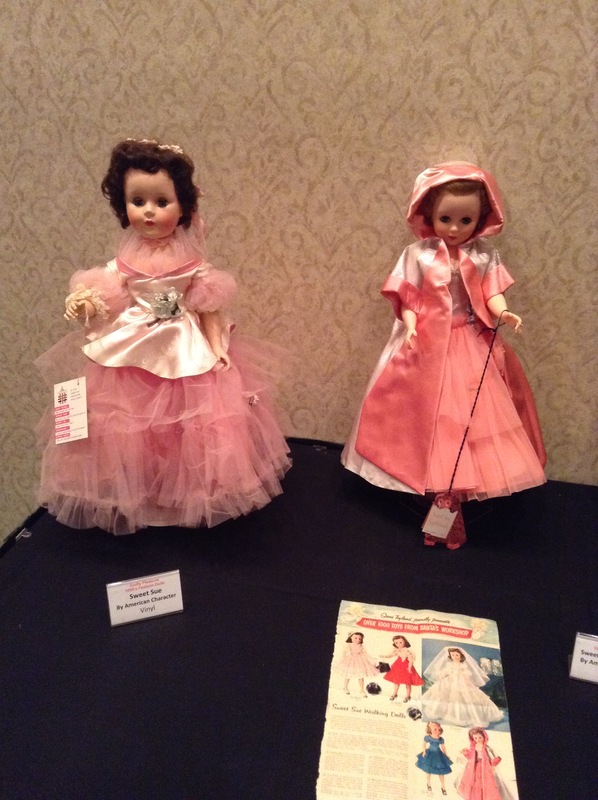 Inside were issues of Haute Doll and Dolls Magazine. Woohoo! Reading for the flight home! 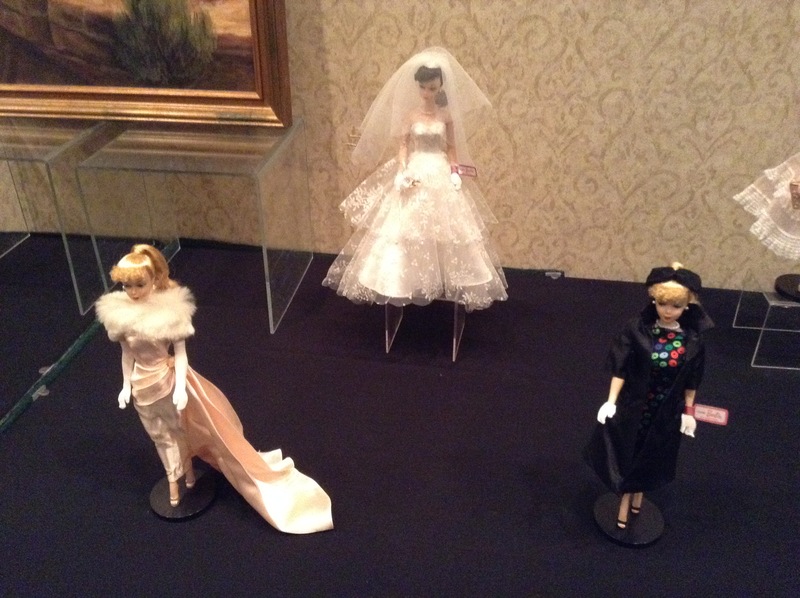 The Wilde companion dolls were on display at the registration desk. I wanted them all. In back, Evangeline Loves Sweets. In front, Angelique Loves Lingerie. She would become my first Angelique. Far East Day Dream Ellowyne. Resin. Fell in love, but did not purchase. Something I now regret. There wasn’t much to do between registering and the first event, so I wandered the hotel a little and took some shots of the lobby/convention areas. 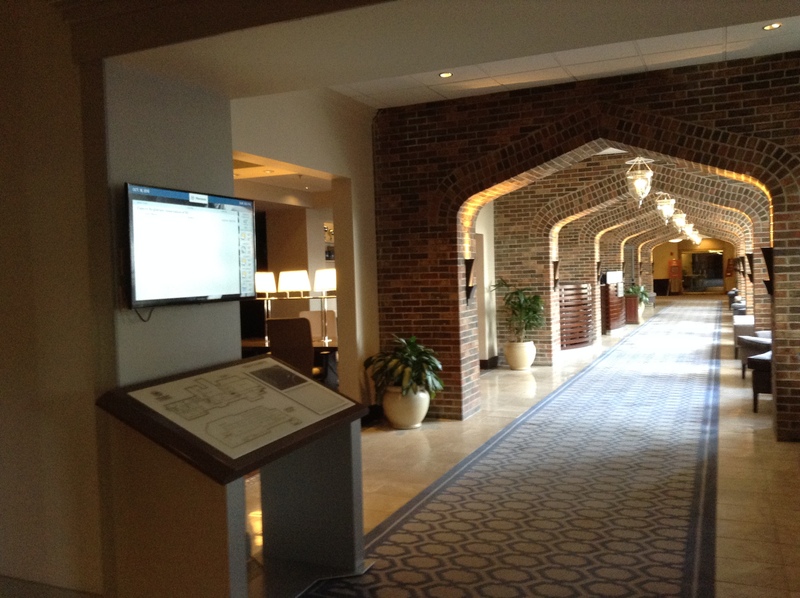 The gorgeous – not to mention spacious – hotel lobby. 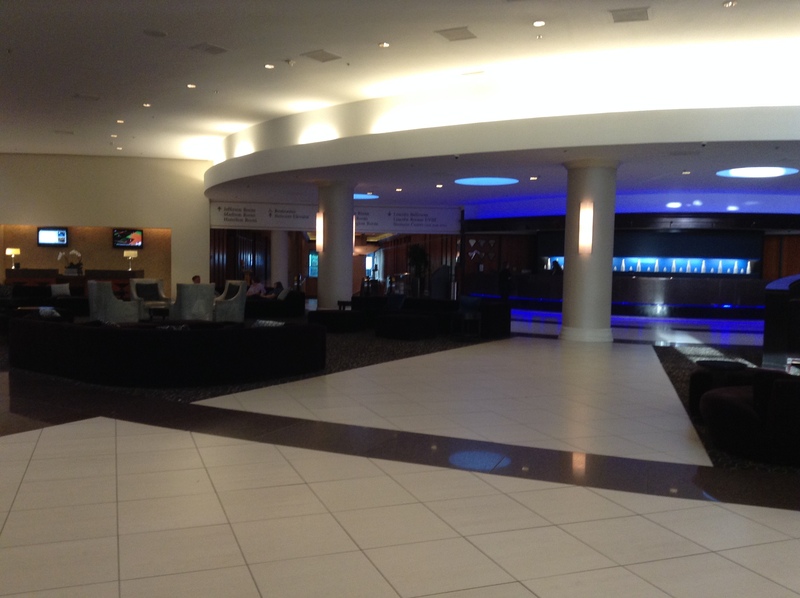 The convention area was downstairs off the lobby. 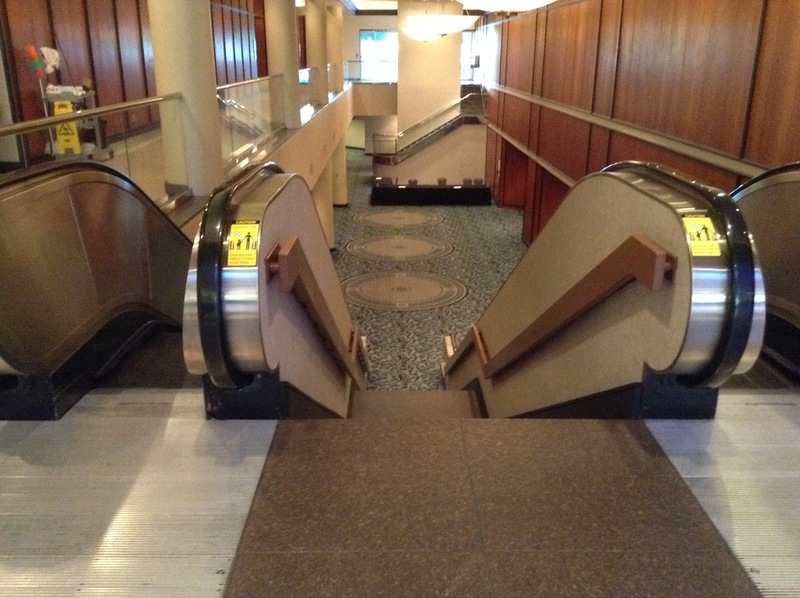 Fortunately, escalators. But at last! 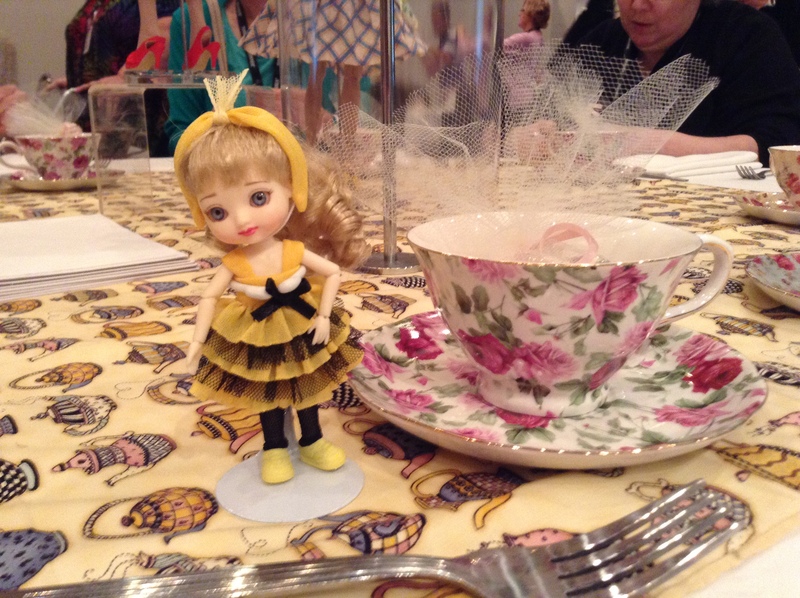 It was time for the first event — the Wilde Tea Party! 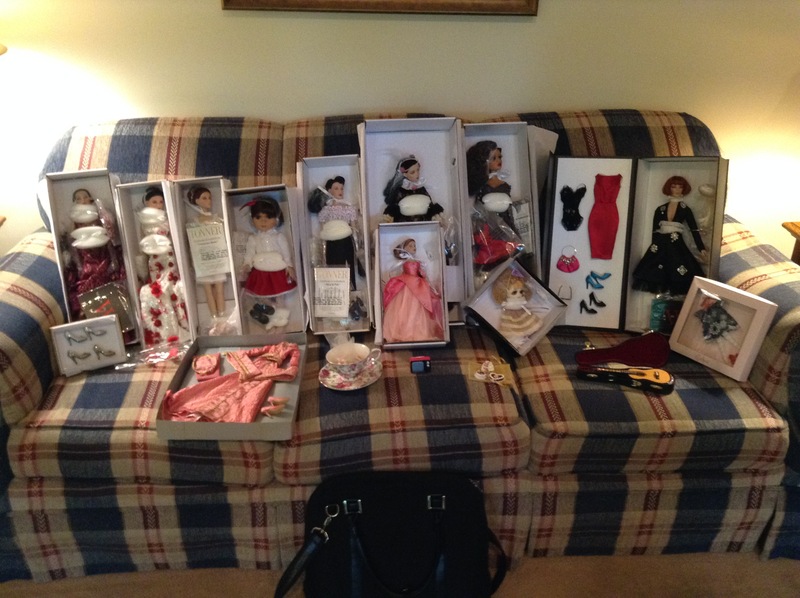 I’m always super excited for the Wilde events, as Wilde Imagination dolls make up the bulk of my collection. 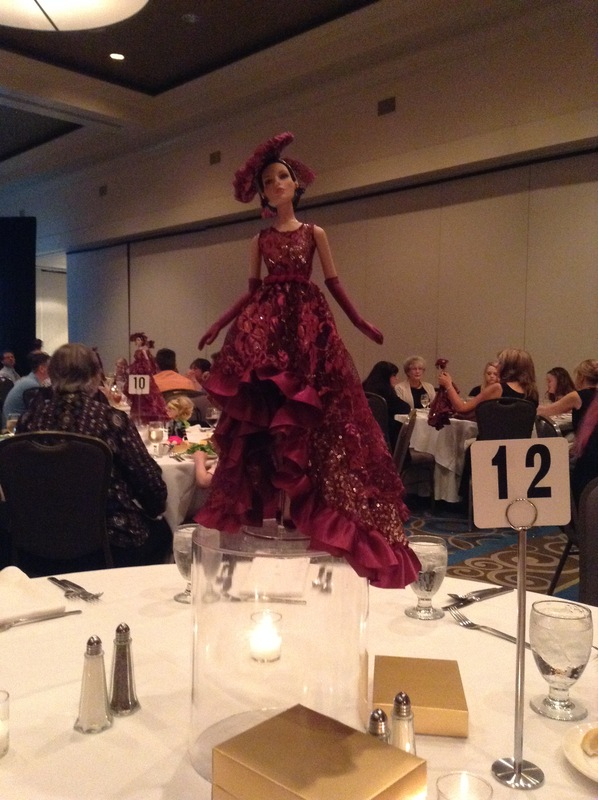 Plus, I always love the centerpiece the design team comes up with! And they did not disappoint! 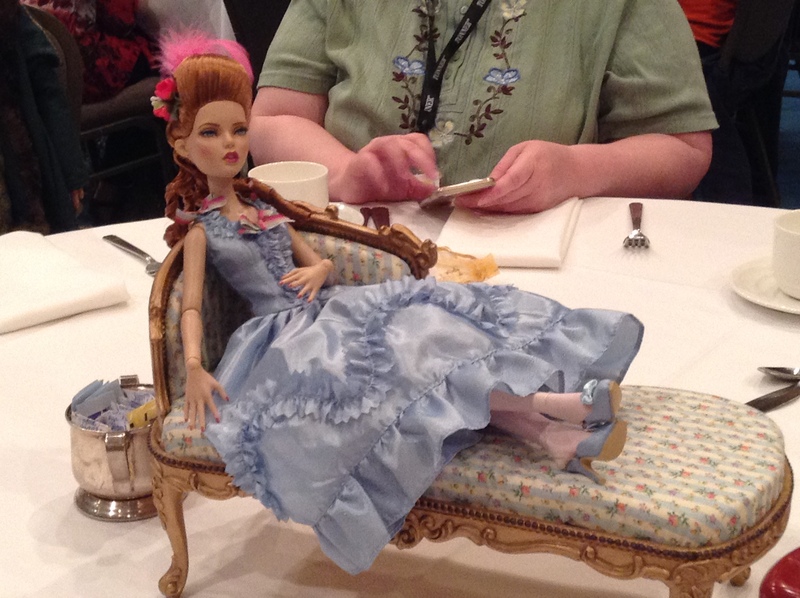 Vintage Tea Ellowyne — she came with an entire tea set! 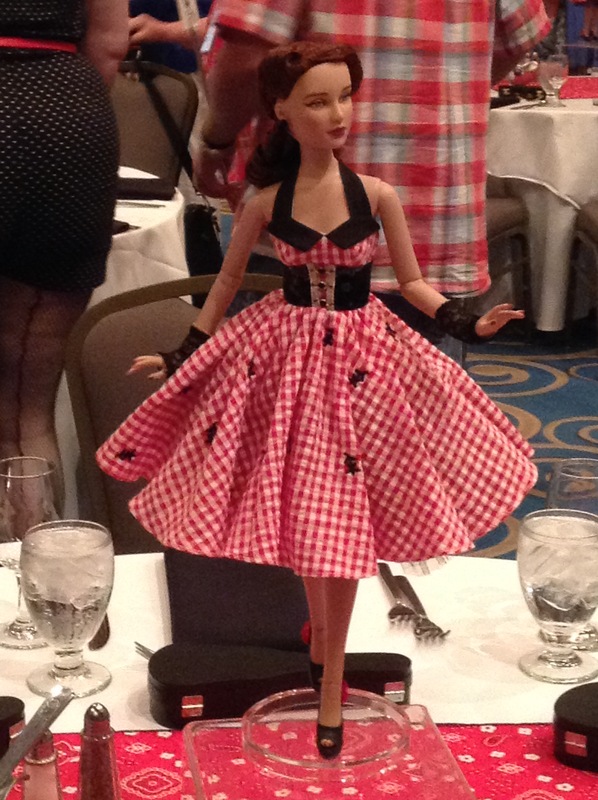 LOVED the centerpiece and their ’50s look! Their aprons reminded me SO MUCH of my grandmother’s handkerchiefs I played with as a child. But as much as I loved these, I did not buy any of them. 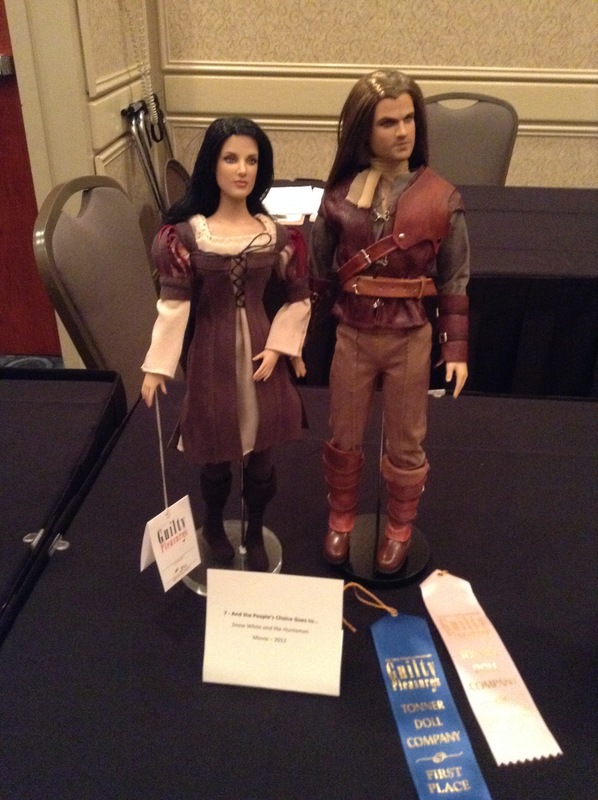 I wanted the companion Angelique doll, and this was, after all, only the first event of the weekend. Tea with Ellowyne, Lizette and Pru! Who cares about the rain outside? And hope the fun never stops. To share our common passion. You’re never sad at convention! Shannon thankfully volunteered to read it on stage and our table was one of the finalists! In the end, we came in third, and though we didn’t win anything, it was still a lot of fun! The entertainment was a “cake decorating contest” between two Tonner employees and a member of the audience… which ended with more frosting on the participants than on the cakes! Too funny! 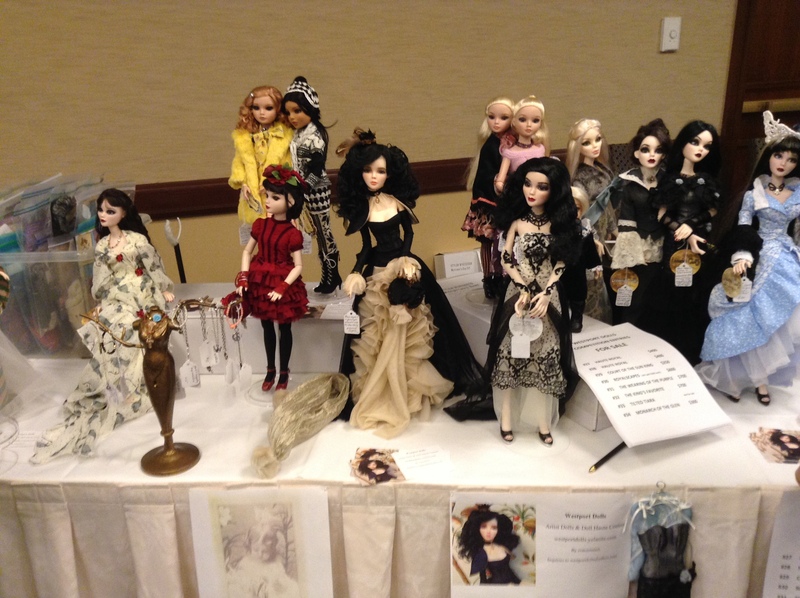 After the tea party was over, the Tonner sales room opened to sell the companion dolls and I walked away with the stunning Angelique Loves Lingerie! My first Angelique! Super excited to get her! 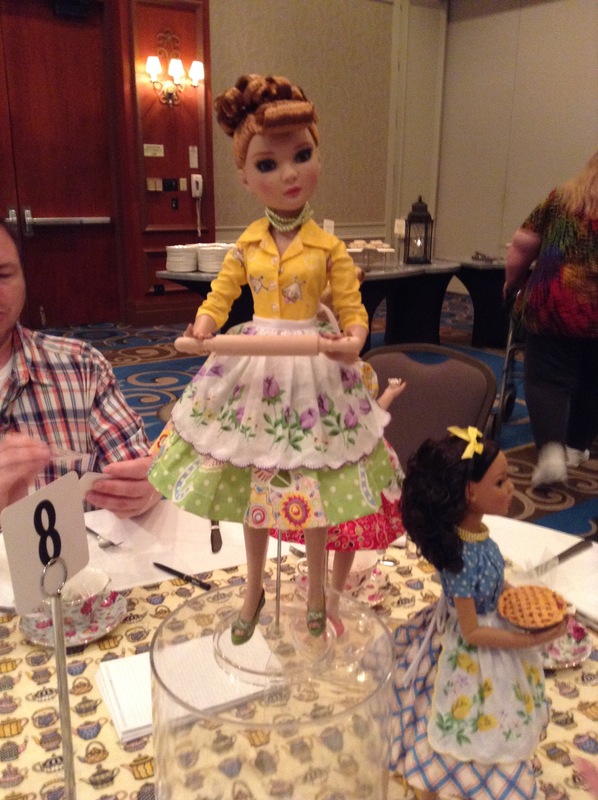 The second event of the day was the “Rockabilly” dinner event! 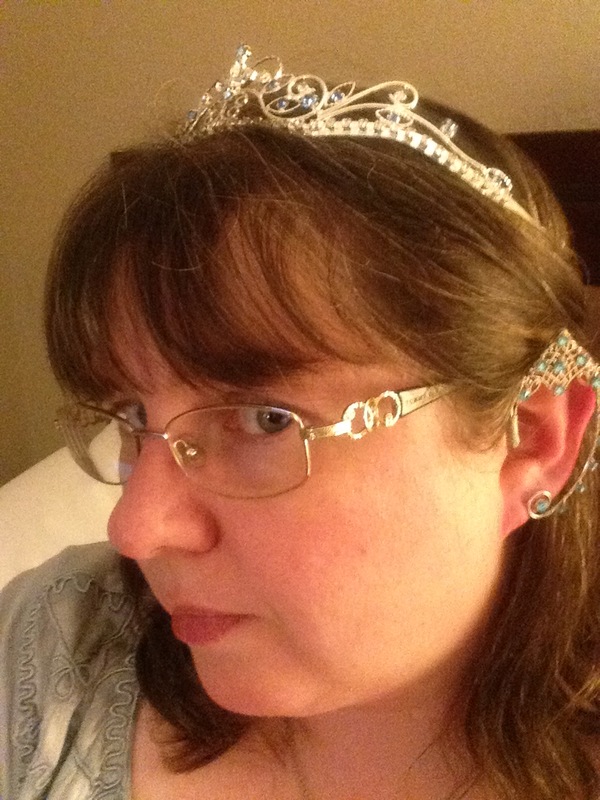 You’d think, having grown up on the Cumberland Plateau in Tennessee, I would have appropriate costuming, but alas. I did throw a bandana in my hair just to join in the fun. 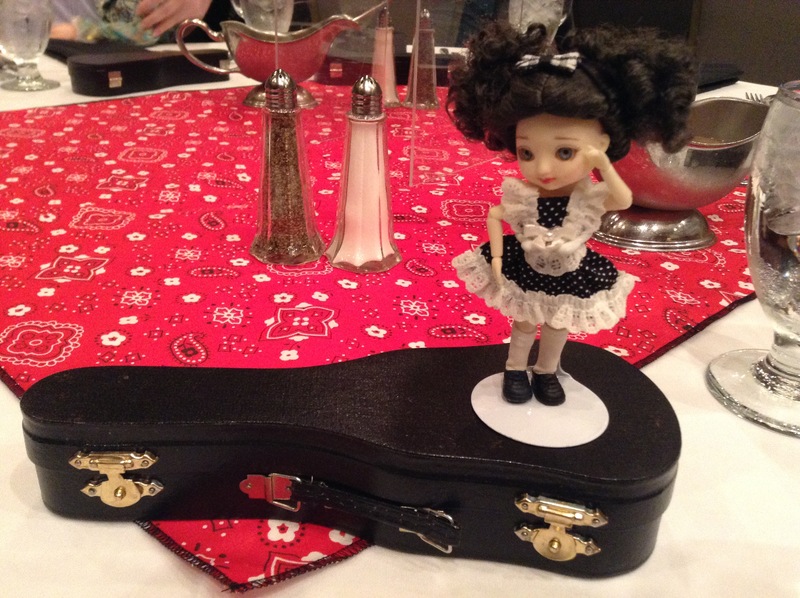 Amelia was delighted to find a doll-sized guitar as our table favor! A little too big for her hands, though. 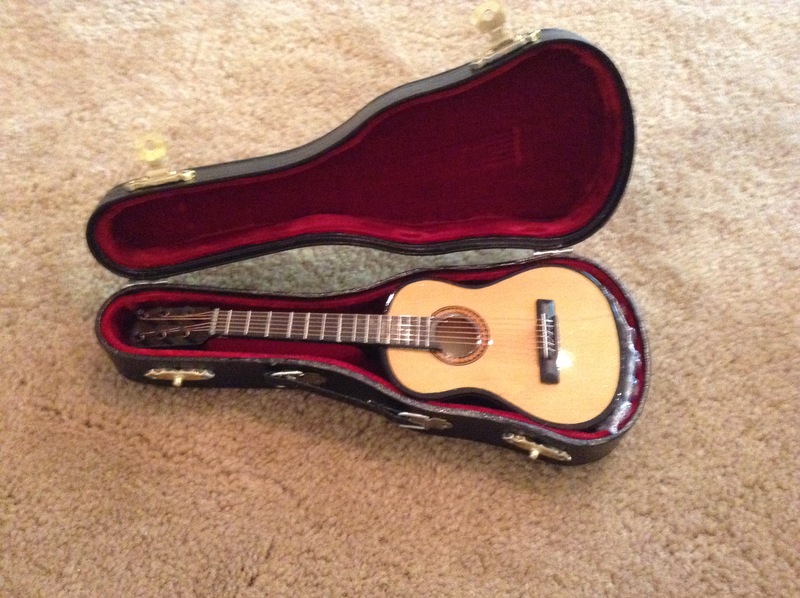 Along with my violin and harp, I will soon have a whole orchestra! 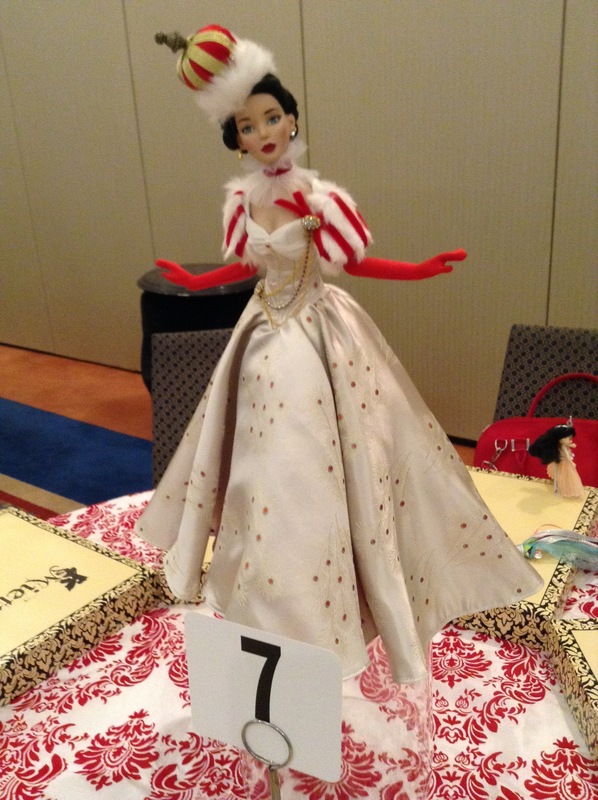 The table centerpiece was a lovely gal named Dixie. As that is the name of my puppy-dog, I was tempted, but Thomas ended up taking her home. She screams Old Southern Charm! Dinner was simply an ENORMOUS piece of chicken, roasted potatoes, beans, a salad, followed by a scrumptious piece of caramel cake. 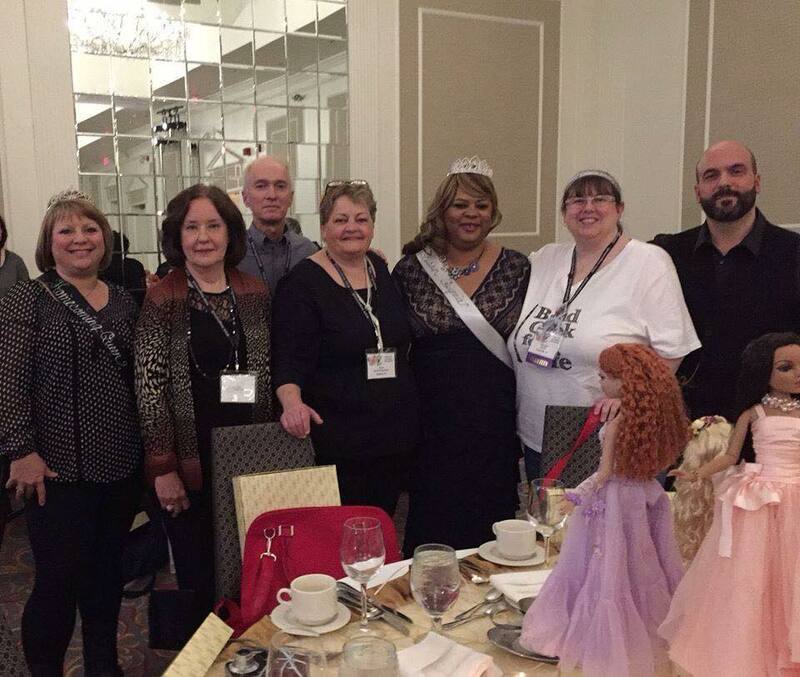 Due to some last-minute rearranging and some cancellations, there were only five people at our table. Which was quite nice, as I am not good at dealing with crowds. Thomas proved once again to be a gracious table host. 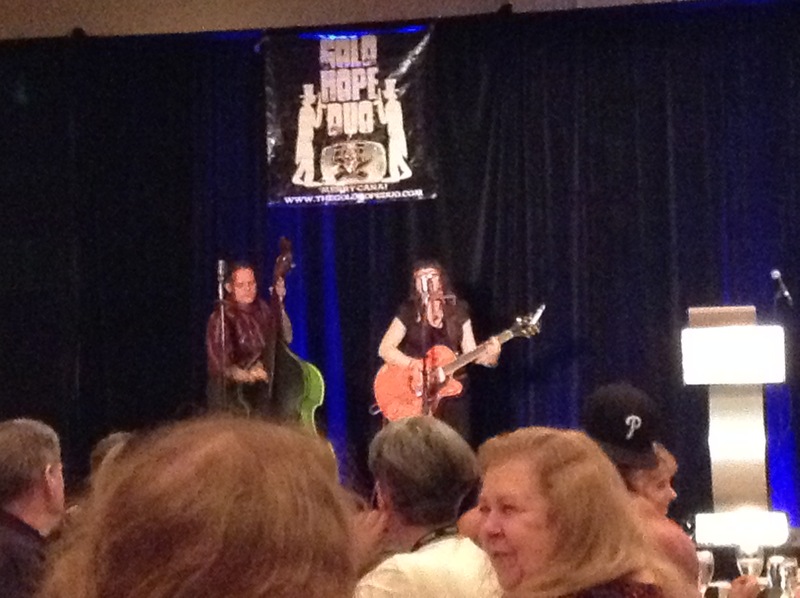 Our entertainment for the evening was a group from New York called the Gold Hope Duo, who played some “rockabilly” type tunes for our enjoyment. I rather enjoyed listening to them! Amelia was delighted to meet up with an old friend, and a new one! 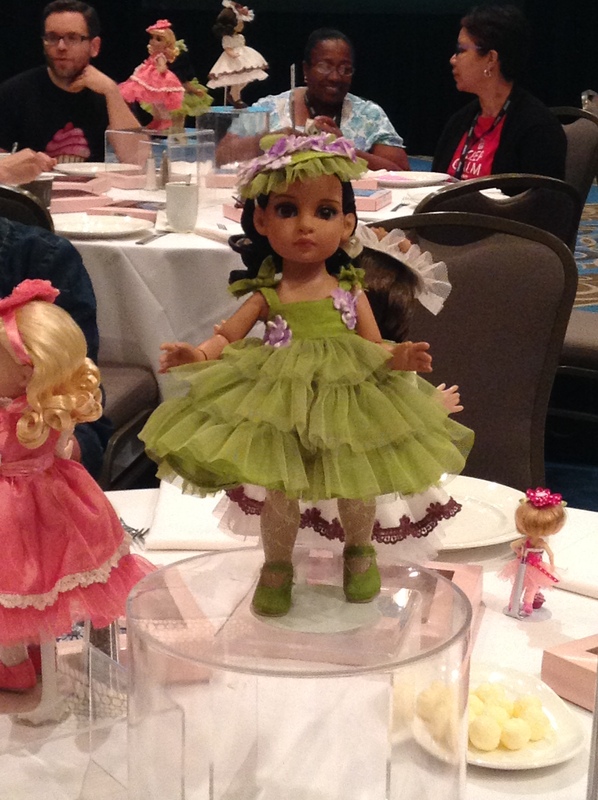 When the dancing was over, it was time for our first dolly surprise! 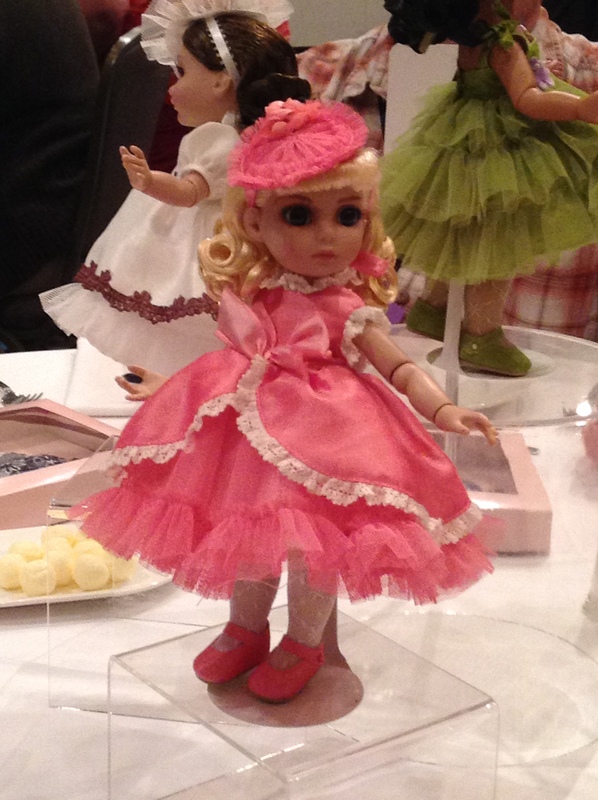 We were presented with Maxine, a new head sculpt on the Chic body, dressed in the southern style! Gorgeous! The vendor room opened later that evening, and I browsed, but restrained myself. I really could kick myself for not getting a photo of Shannon and her lovely creations! 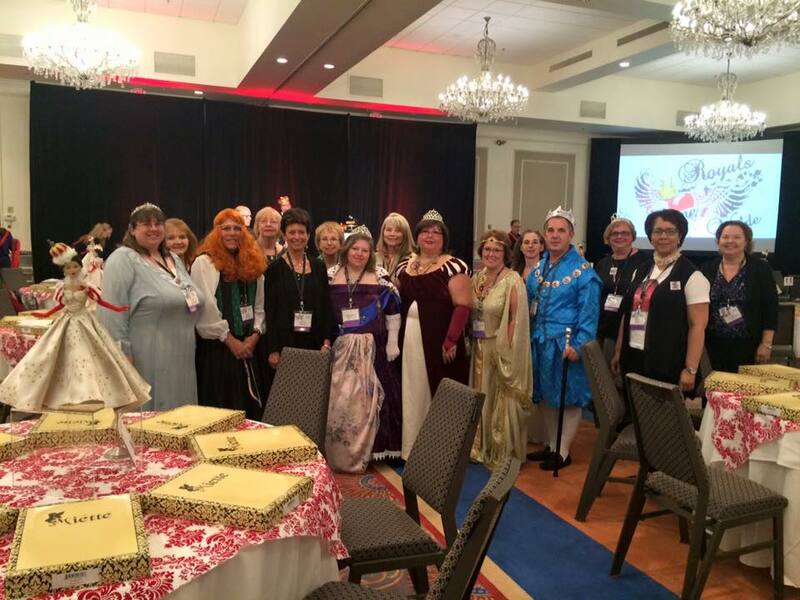 Fortunately, Michelle from Tonner did an AMAZING job documenting the convention, as always! 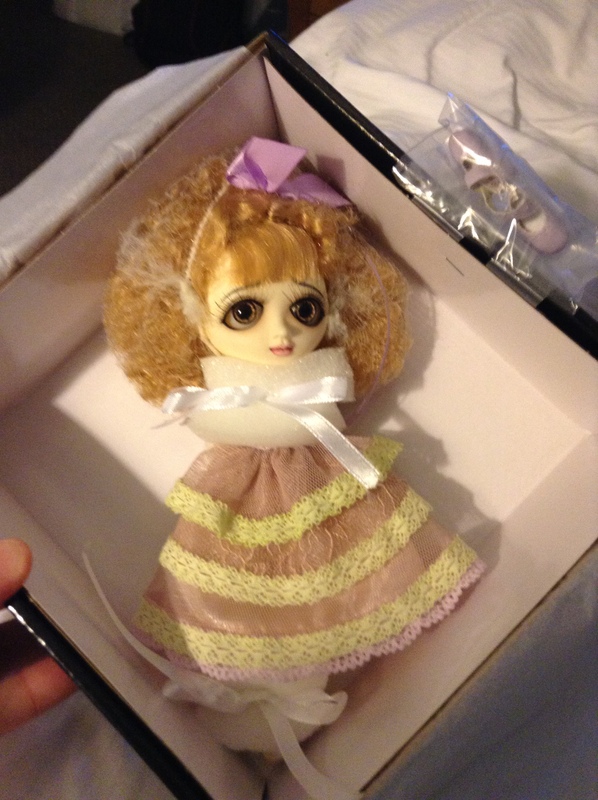 Finally, time for bed to dream of dollies to come!